BUT I think I may have cracked my staple sourdough recipe now using quite an ingenious method. Hot Pot Sourdough! I realised that the sourdough strength (how active it is) and thickness (or rather the ratio of flour to water if you want to get all technical about it) plays a massive part in how successful a loaf is. 2. Feed your starter at least 8 hours before you want to use it! 4. 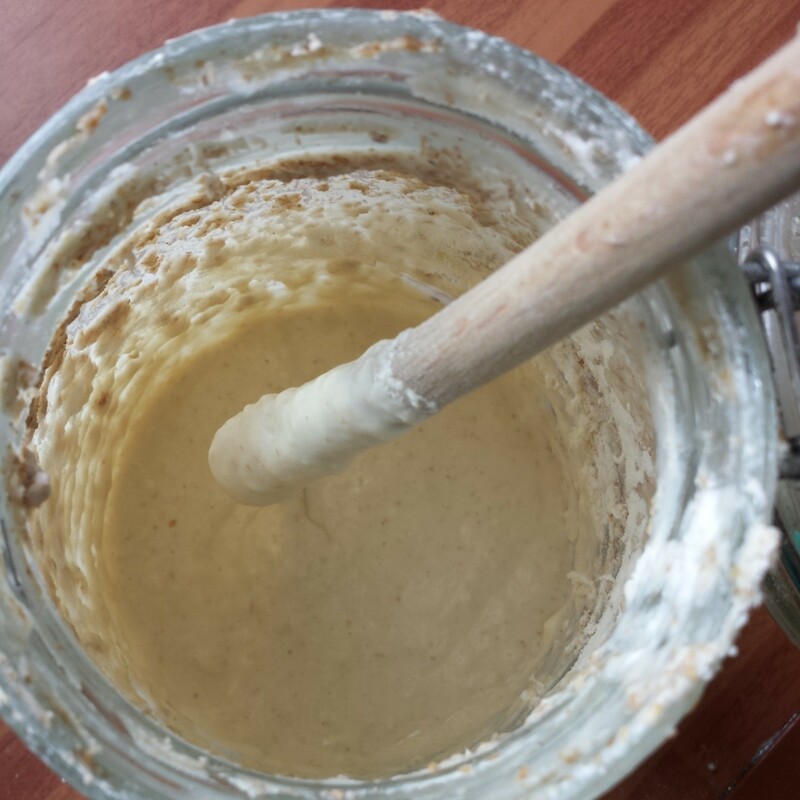 Leave the rubber seal on the jar of sourdough starter. This means when you close the jar lid it’s airtight. (It seems to help keep it more active and fresher for longer.) BUT you will need to open the lid to release the built up air once a day (especially after its been fed as its most active!) to stop the jar exploding. 4. Wait until the starter is frothy (8 to 24 hours after feeding it).Then you know it’s ready to use. 5. 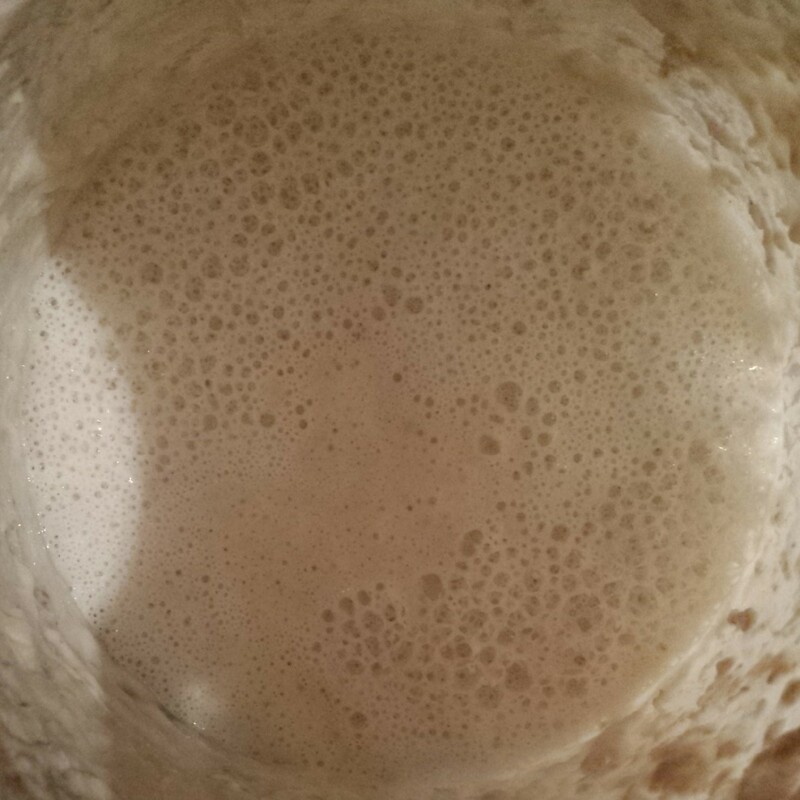 If your sourdough starter starts to split and gather a layer of water/black liquid on top it’s hungry! Pour most of your starter away and give it a good feed. 6. 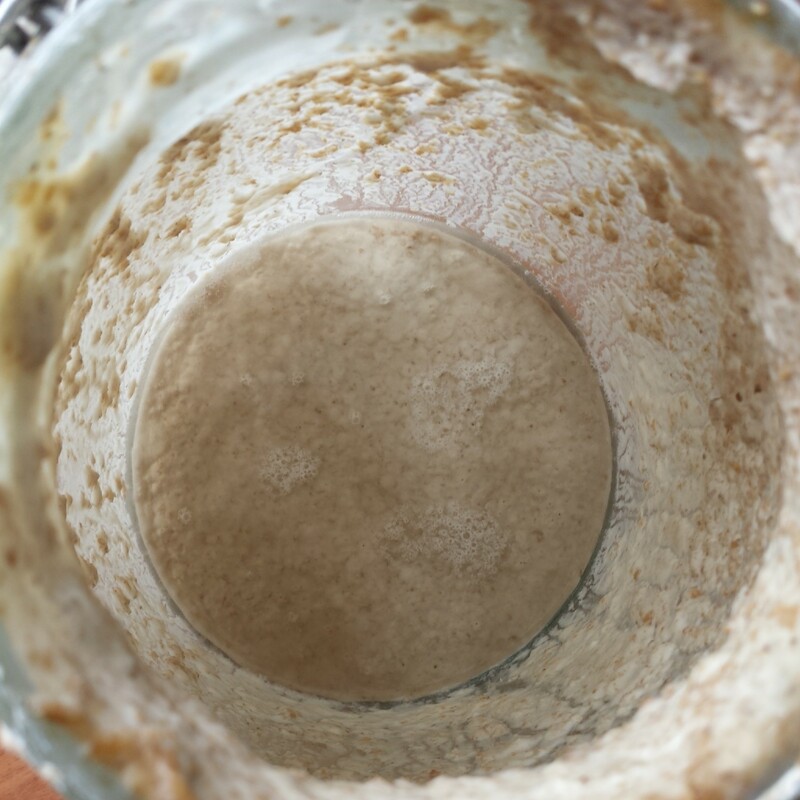 I give my starter a good (400g flour and 400g water) feed once a week, the day before I want to begin my bread. I leave it at room temperature everyday and try to remember to feed it when it’s starting to look hungry/spilt (usually once every 2 to 3 days). I would feed it every day if I was baking a lot of bread. But half a cup of flour and half a cup of water will suffice as a mini feed to keep it active in between big feeds. Try to feed it a small amount every couple of days. 7. 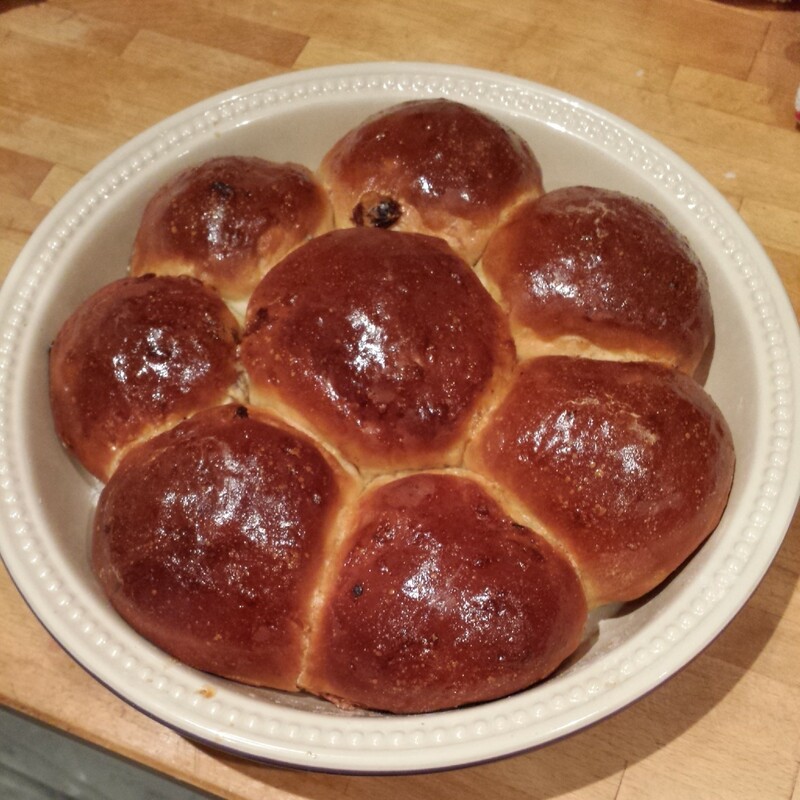 Invest in a banneton (proving basket) or two – I have a rectangular and a round one for different style loaves. When working with a wetter sourdough loaf the proving baskets help the loaf to keep its shape. 8. Flour the banneton with an even and thick layer. (It helps to leave the pretty swirly patterns). Or if using a cotton liner inside your basket, flour the liner to prevent the dough sticking. Use a shower cap or cling film to cover the top. Prove the loaf in the basket over night in the fridge. 9. 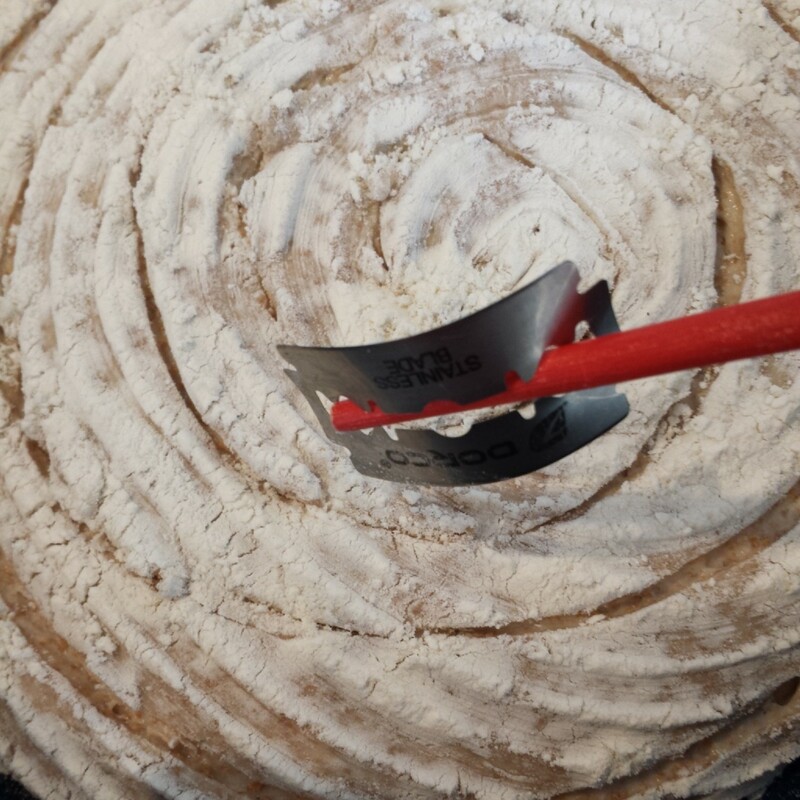 Score it with a razor blade – Get creative with your patterns, creating swirls and slices to help the loaf expand in all the right places as the yeast reacts to the heat of the oven. 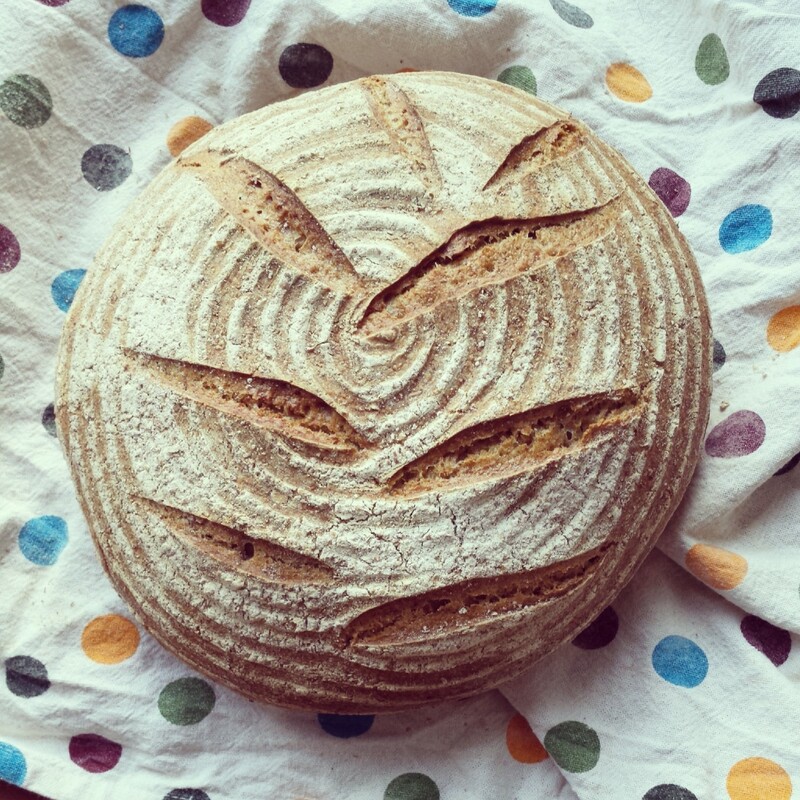 Scoring your loaf will prevent it splitting and it looks so pretty too. 10. Bake in a hot pot! When warming the oven put a casserole pot with a lid in to heat through. I whack my oven up to the hottest temperature for 30 minutes. Sprinkle an even layer of ground semolina on the bottom of your pot and gently tip your proven loaf into the pot from the banneton basket. 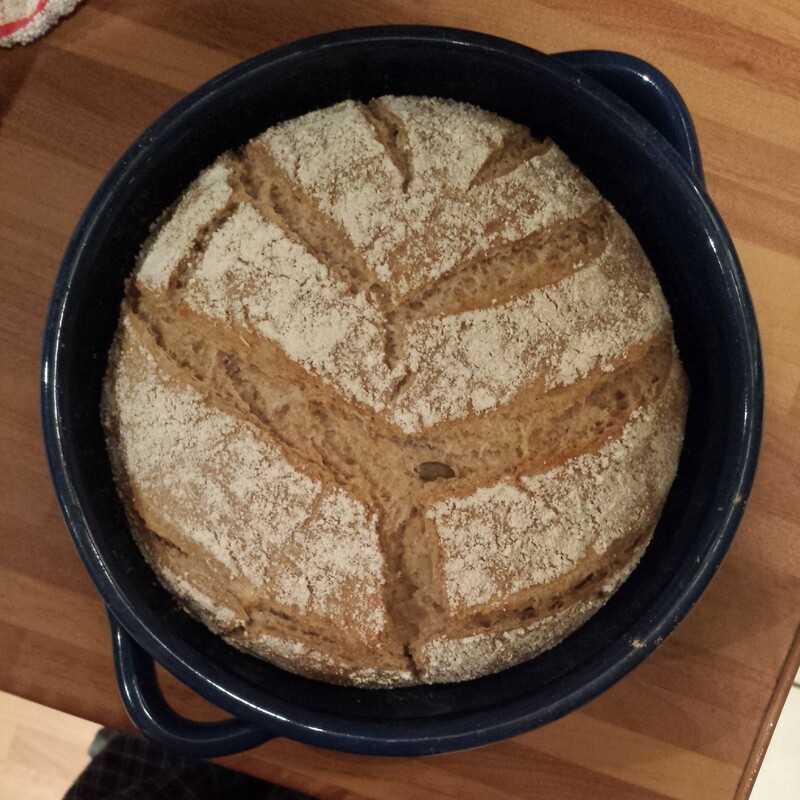 Careful not to knock all of the air out of the loaf as you do so and not to burn your hands on the very hot pot. (Unfortunately you cant bake the bread in the basket so the loaf needs to be removed). I use a round banneton to prove my loaf in and a round pot to bake in. Pop the lid on the pot and place it in the oven at the hottest temperature for 15 minutes, then turn the temperature down to about 220 degrees C for the final 15 minutes. I use a glazed terracota casserole pot which can take the heat and protects the bread from scorching. Keeping the lid in place means all of the steam is retained in the bread, which adds extra moisture and softness to the bread AND results in the most amazing ‘oven spring’ you will ever see in your bread. I guarantee it! It will double in size. A splash of olive oil (approx 1-2 tbs depending on the flour, enough oil to bring the dough together into a shiny ball but not to much making the dough wet and sticky). 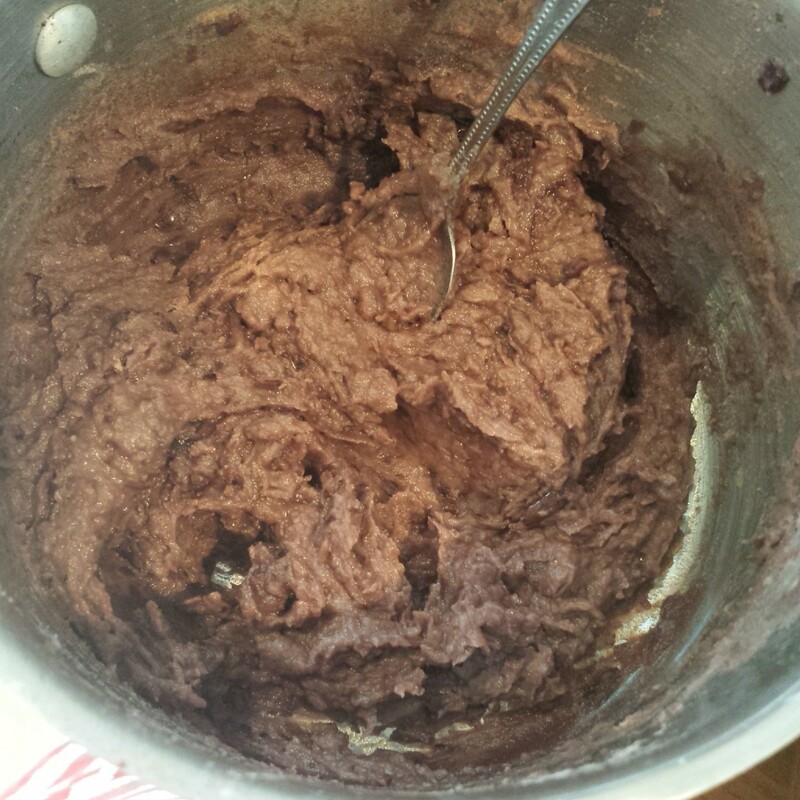 Pour the salt, flour, sourdough starter, barley malt extract (if you’re using it) and water into a mixing bowl. 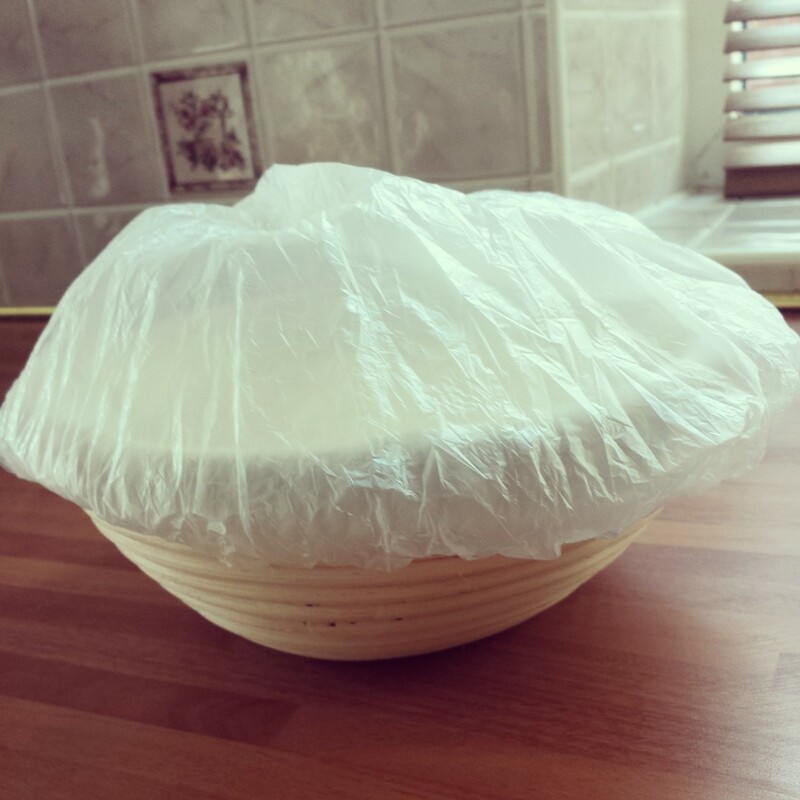 Cover the bowl with cling film/shower cap and leave to prove overnight in the fridge or for 2- 3 hours at room temperature. Knead and shape your loaf on a lightly floured surface to knock out the air bubbles. 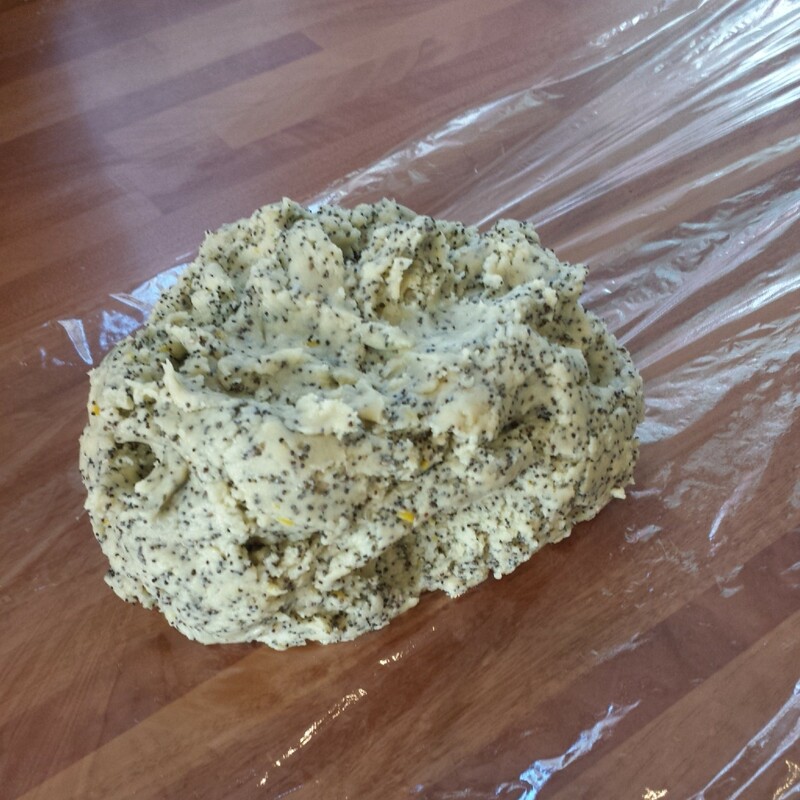 If you want to add seeds, now’s the time to knead them into the dough. Place into a floured banneton (or loaf tin), cover with a shower cap and prove over night in the fridge or for 2 hours at room temperature. Gently tip the proven loaf from the banneton, moving he basket as close to the hot pot as possible. Don’t worry if you’re slightly off centre, the loaf will sizzle as it hits the hot surface, firming the base of the loaf up. It can then be gently slid around the pot if you tilt it to one side. Don’t try to move it with your fingers as you’ll knock the air out and probably burn yourself! Score the loaf with a sharp knife or razor blade. Pot the lid on the pot and bake it at your oven’s highest temperature for 15 minutes. (250 degrees c) Turn it down to around 220 degrees c for the final 15 minutes. You can check the bread is cooking by taking the lid off. Looking for a soft crust? Wrap your hot loaf up in a clean tea towel to hold in the moisture and soften the crust. Leave it to cool fully in the tea towel. Looking for a crisp chewy crust? Take the lid off the hot pot for the final 5 minutes in the oven. Leave your loaf to cool on rack. Slice it up and enjoy! I often eat this bread without any butter at all, as it’s so moist it really doesn’t need anything to liven it up. Just pure unadulterated sourdough joy! Once cooled I pop the loaf back into my pot to keep the air out and keep it fresh. It lasts for at least a week. If I’m not going to get through a whole loaf I like to slice it up thinly and freeze half. Then I can defrost a slice at a time as I need it. P.S. 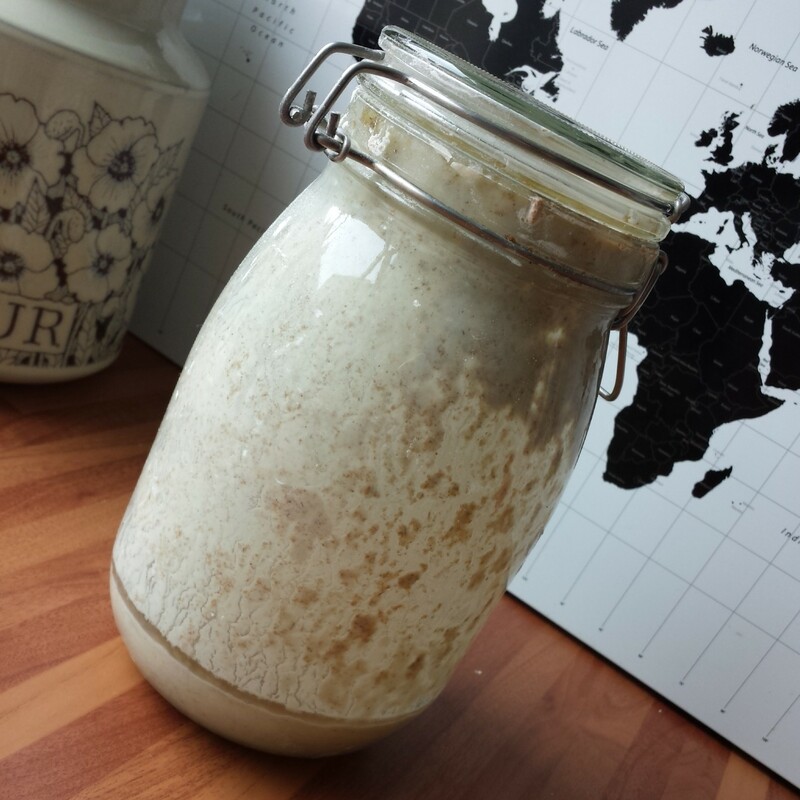 My original sourdough experiments can be found over on my post ‘Starting Sourdough with James Morton’. Cookie, cookie on my plate what will be your delicious fate? Lemon conjures up memories of spring time, Easter and fresh starts. As we’re nearing the final 20 bakes of my around the world in 80 bakes venture I’ve accumulated a lot of random ingredients that seemed like the most essential purchase at the time. Like I’m ever going to use that pomegranate powder, gram flour, black mustard seeds and 4 bags of poppy seeds… So I’m getting creative. Working with what I have to make some new recipes, tweaking more traditional bakes to suit my more interesting ingredients. 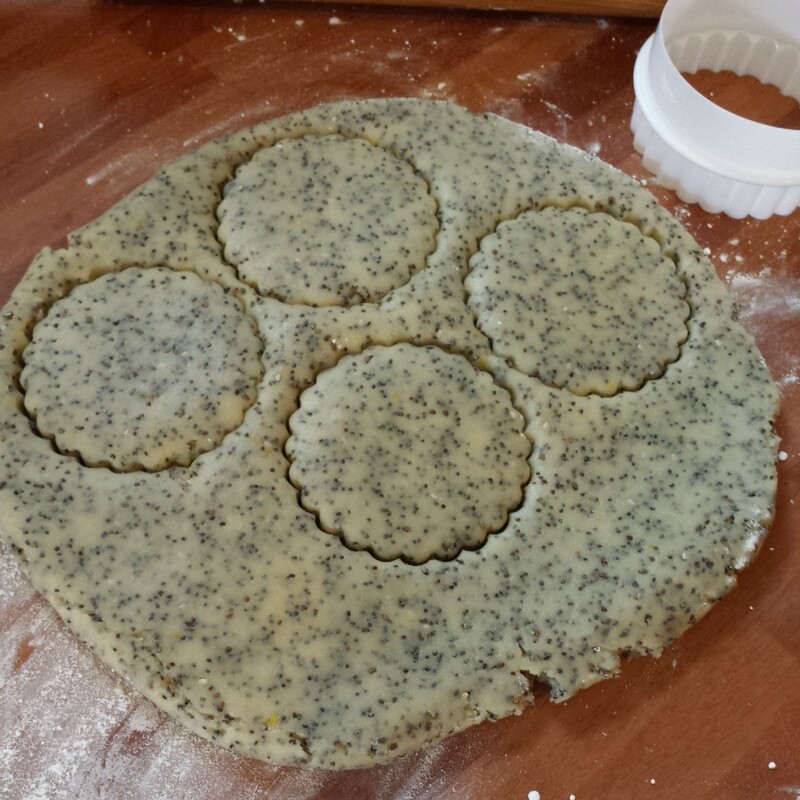 All the recipes I found for Hungarian Lemon Poppy Seed Cookies were rather wet doughs, which had to be dolloped onto the baking tray or pinwheels with a poppyseed spiral running through them. 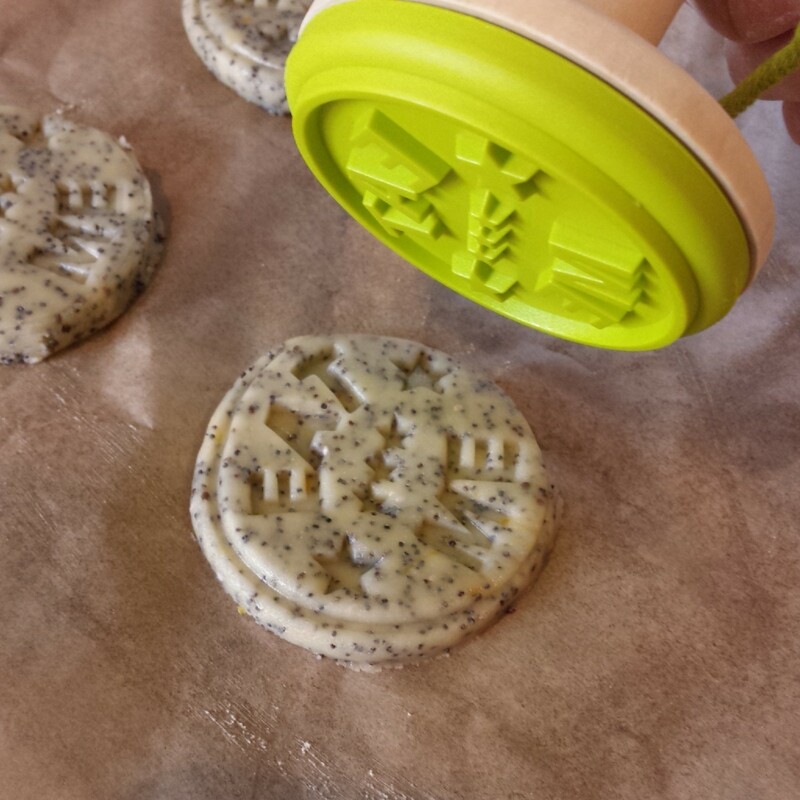 I’m usually a fan of any recipe that doesn’t require a rolling pin but I received a beautiful cookie stamp for my birthday so I wanted to make a rollable dough so I could stamp away. This recipe had to be tweaked gently to avoid creating too firm a dough as I would end up with a basic shortbread recipe, which is rather more Scottish than Hungarian. 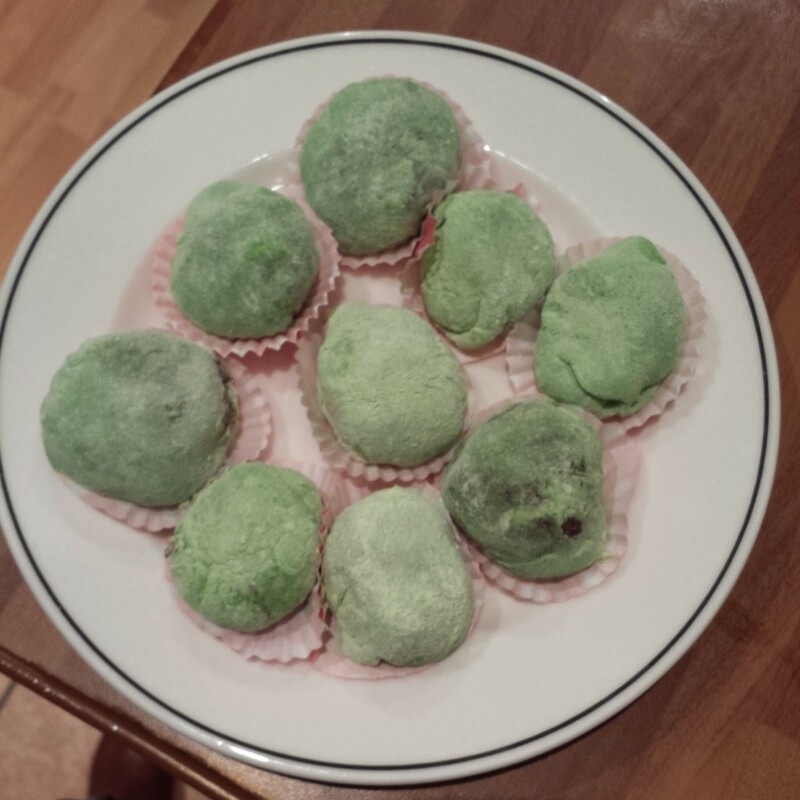 I took inspiration from Munn Cookies which are a traditional Jewish recipe. 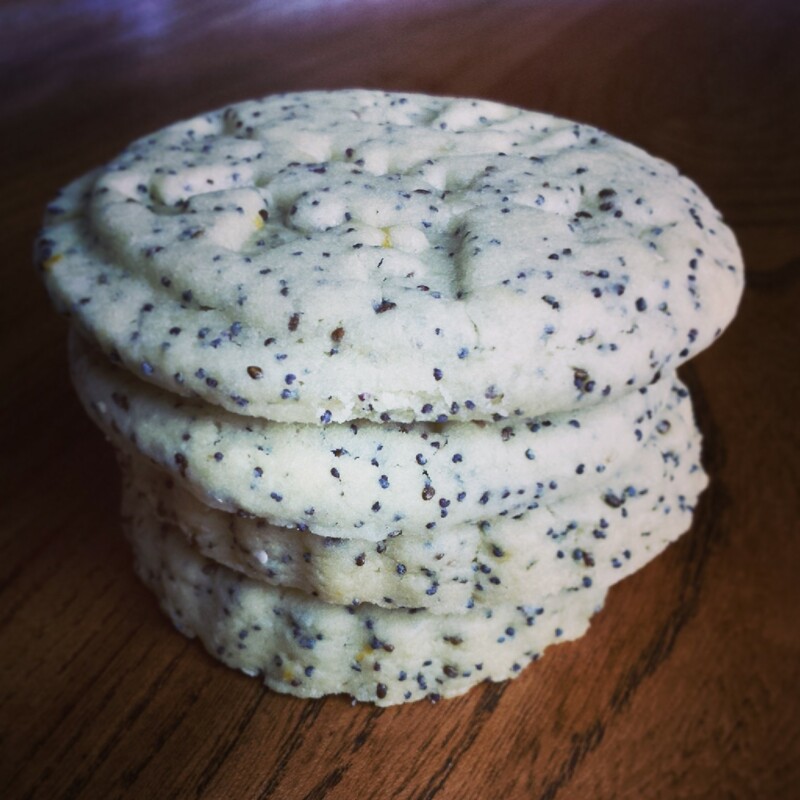 My Lemon Poppy Seed cookies are a Hungarian Munn Cookie hybrid! They’re a slim cookie (or biscuit to me) with a comfortingly crisp and crumbly texture. To make my recipe more mouldable I added more of everything. Calculating it carefully to get the balance right between the flour, sugar, seeds and butter. Creating a smooth buttery dough which rolls out beautifully once chilled. Chilling the cut and stamped cookies is the key to holding the shape and preventing too much oven spread. These biscuits are pretty quick to bake. They take less than 15 minutes to whip up (especially if you’re using an electric mixer) and only 12 minutes in the oven. They spend longer in the fridge chilling than they do in the oven! 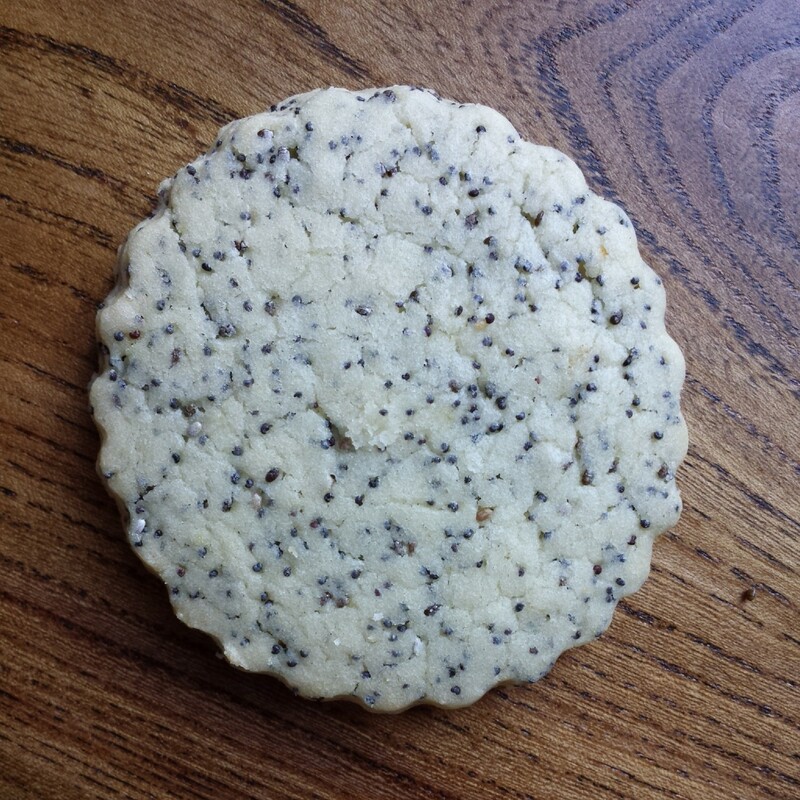 In addition to tasting great and looking pretty the poppy seeds bespeckling the cookies add an extra healthy dimesion. 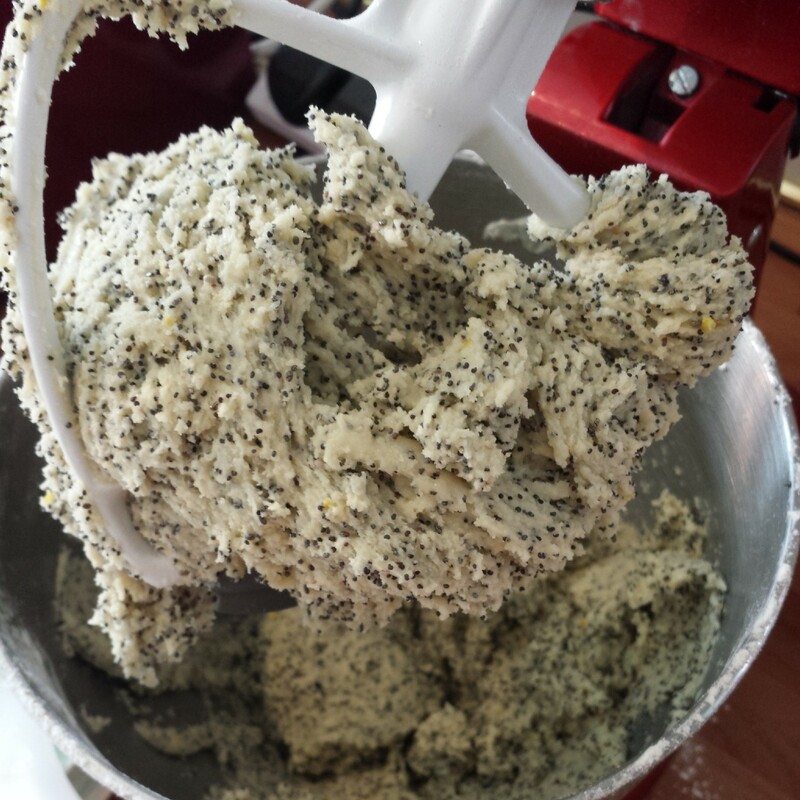 Poppy seeds are very common in many European baked good from bagels to seed cakes. They were traditionally incoporated into many desserts and breads as they are packed with nutrients, minerals and fibre. 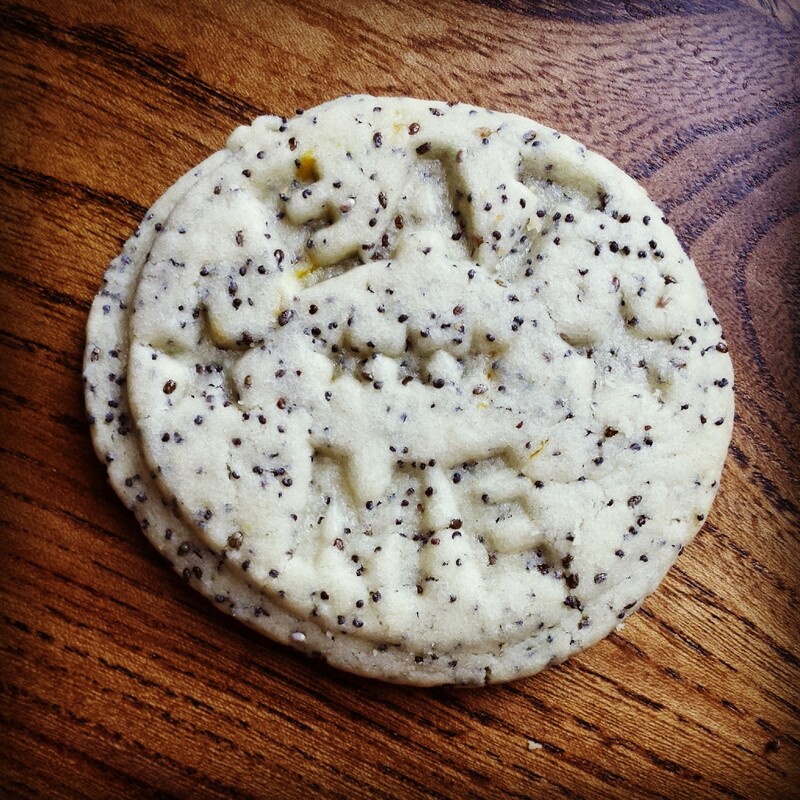 It’s suggested that Poppy Seeds can help with nausea and stomach upsets too. 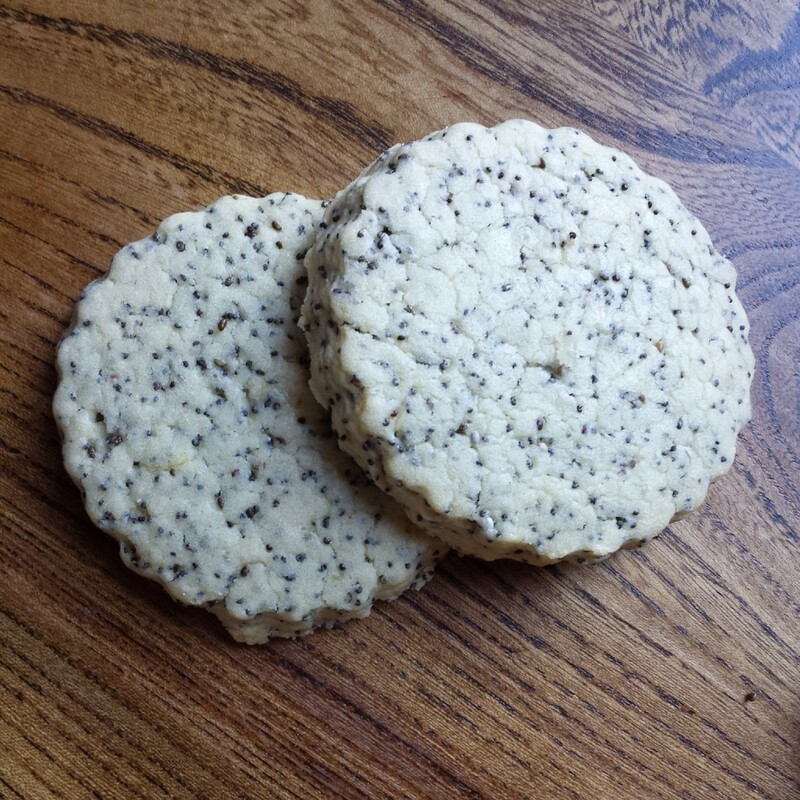 I also added some Chia Seeds for their superfood qualities to make these cookies a more health conscious snack. 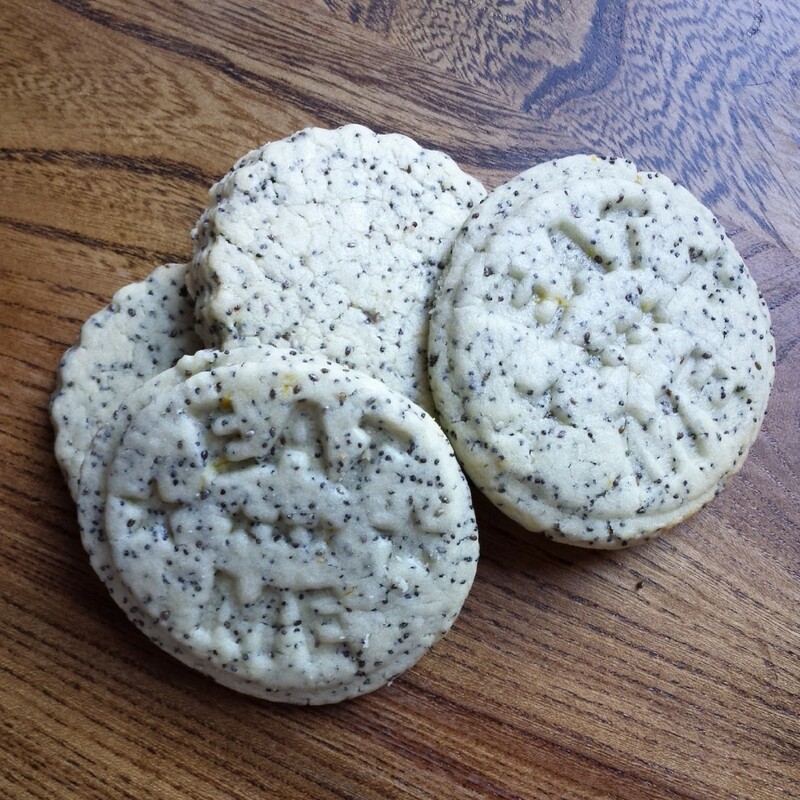 The Lemon Poppy Seed Cookies are lovely. They retain their pale colour after baking so don’t expect them to develop a golden oven tan! They puff up slightly in the oven, leaving a smooth and shiny finish. They’re crisp and crumbly with a great crunchy texture owing to the seeds. You could add fewer seeds if you prefer, but I wanted to pack as many in as I could! The finished cookie reminds me of slices of dragonfruit. These biscuits are subtle in flavour and high in texture. The lemon flavour cuts through the crunch for a perfect Spring/Summer snack. They’re light and not too sweet. (But if you like sweeter biscuits you could add some water icing or melted white chocolate.) They freeze really well too (uniced), so you can keep a constant supply to hand. 1. Beat together the sugar and butter until light and fluffy. 5. Beat in the lemon juice. 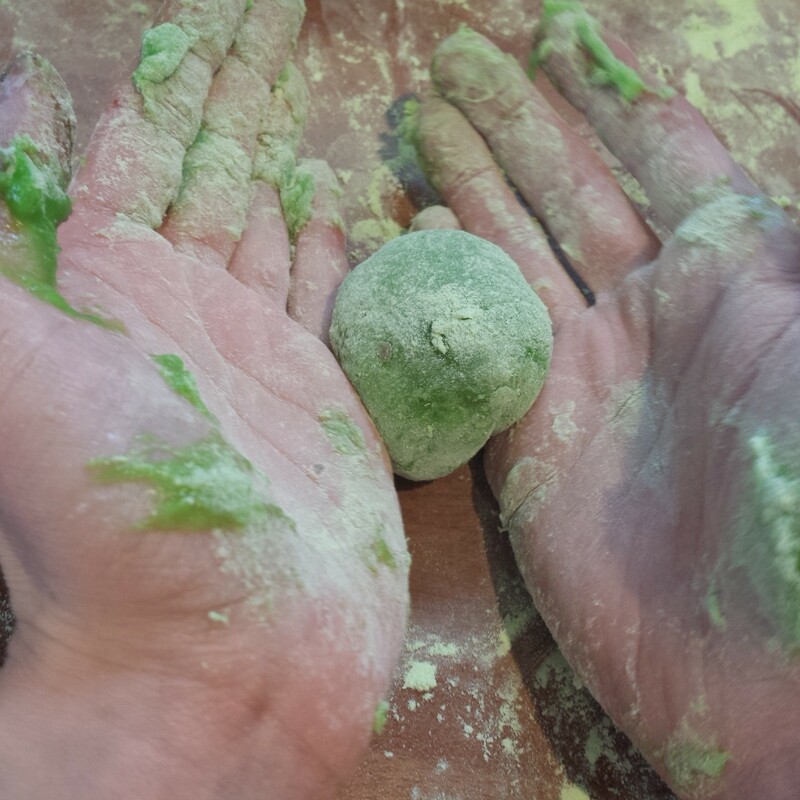 Until the dough comes together in one ball. 9. Cut out 3 inch rounds (or whatever shape you prefer). I used my stamper here, gently pressing it into the dough. 11. Bake for 11-12 mins at 175 degrees c for a soft cookie or 15-17 minutes for a crisper biscuit. 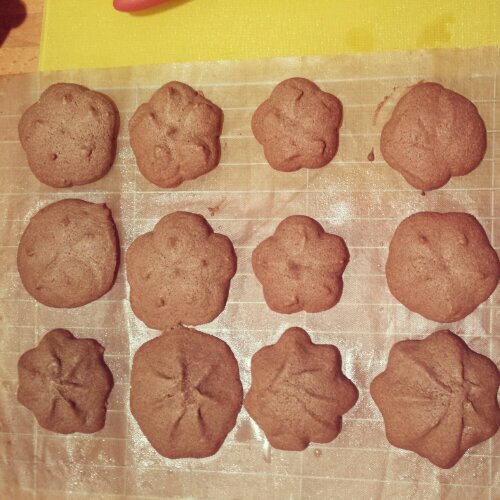 The cookies won’t take on any colour during baking so if they start to turn brown they’re more than ready! When my bananas are on the turn and almost ready for the bin I throw them in the freezer in their blacken skins to save for a later date. (Yes you can freeze bananas. Feel free to peel them first and pop them in a tupperware container first if you want to use them from frozen for smoothies or milkshakes, then you don’t even need to add ice cream for a chilled drink). Once I have 3 black bananas stockpiled I whip up my Banana Bread. Leave your bananas to defrost for an hour or so before you peel them to make your banana bread, as if they’re too cold it will make your butter solidify and could give you denser cake and an uneven bake. This is really quick to make. Basically beat the butter and sugar together until fluffy. Followed by your bananas, vanilla and eggs, then the combination of flours and baking powder. Finally beat in a handful of sultanas and chopped walnuts. This takes about 15 minutes with an electric mixer. I use two 6 inch round tins to bake this recipe, or you could bake one large banana bread loaf if you prefer. 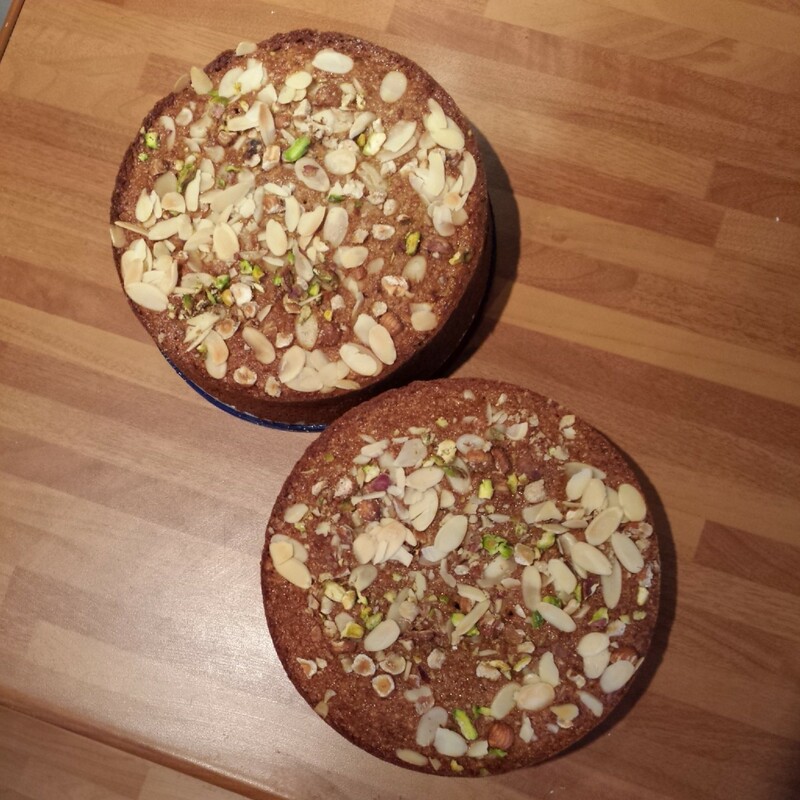 Liberally sprinkle the cakes with chopped nuts (whatever you have to hand is fine). I use pistachios which gives you gorgeous green flecks singing out in between the flaked almonds and hazelnuts. 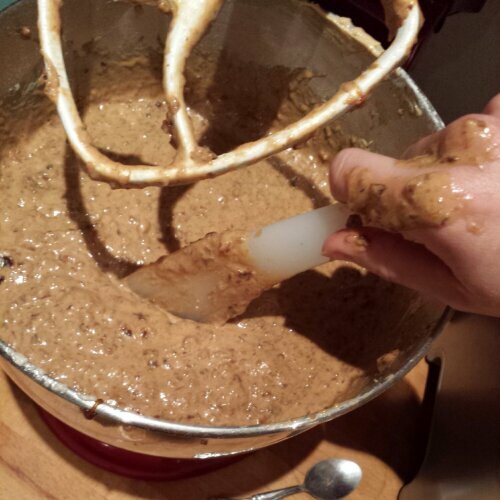 As the cake bakes the batter rises up and supports the nuts, holding them in place for the final cake. It’s also the perfect way to disguise any uneven finishes on your cake, if like me you have an unpredictably hot oven. My initial experiments involved using 100% coconut flour, but this ended in disaster. 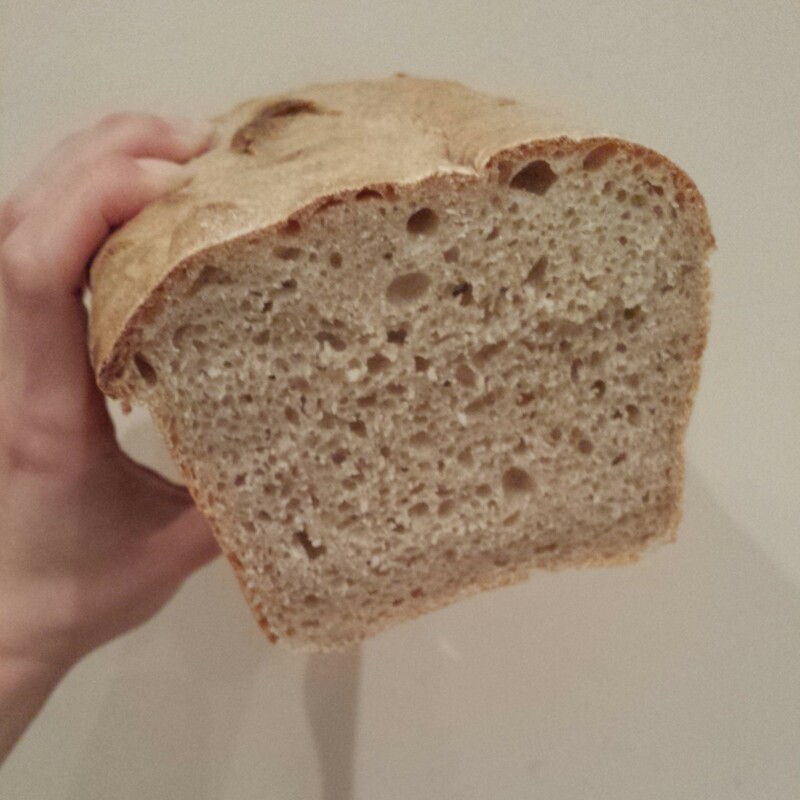 I think coconut flour needs to be balanced against other nuttier flours (I like using rye flour but spelt or wholemeal would work well too) to absorb some of the natural oils and sugars and avoid the quick to burn, blackened mess that I made. 90g Rye Flour (or spelt or wholemeal) -NB: Spelt and Rye flours are not gluten free but may be more suitable to those who have a wheat intolerance. 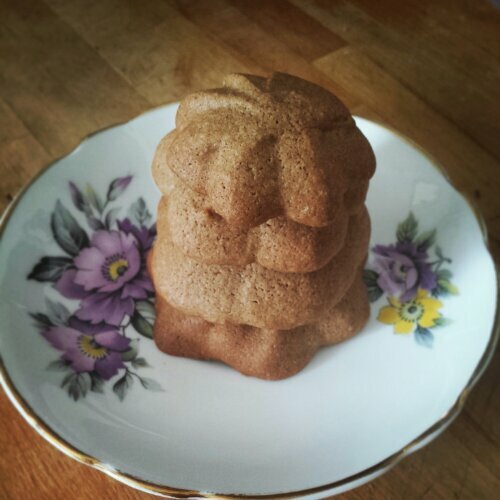 Use a wholemeal gluten free flour if you want to avoid gluten in this recipe. Searching for a suitably exotic and challenging recipe I remembered a wonderful recipe I was given by a fellow cake clubber. 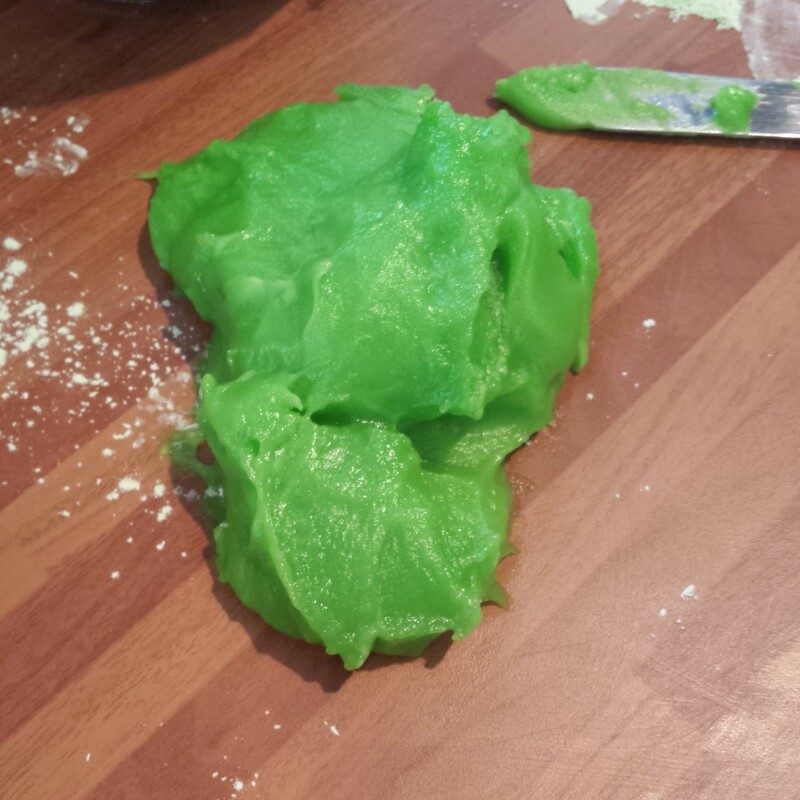 Her family recipe for Pandan Cake. Not to be confused with Panda cake. Although a Panda Pandan Cake would be immense. Pandan is a traditional flavouring used in South East Asia. 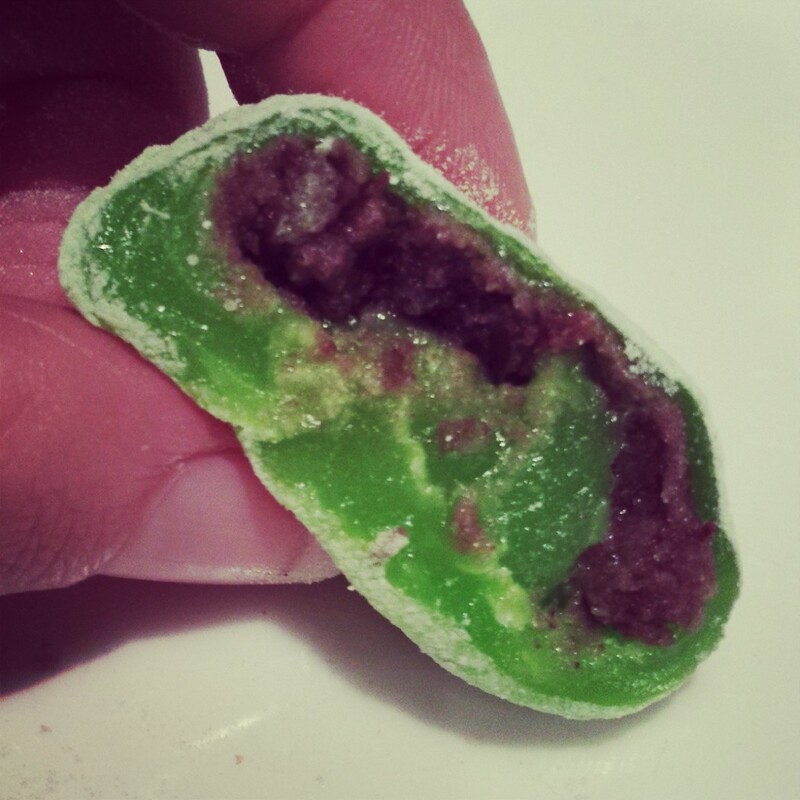 (You might find Pandan Cake in Indonesia, Malaysia and Singapore.) It comes from the leaves of the Pandan plant. It is also used to help flavour dishes such as jasmine sticky rice. If you can get a hold of some Pandan leaves you can make your own extract by boiling the leaves in a small amount of water. 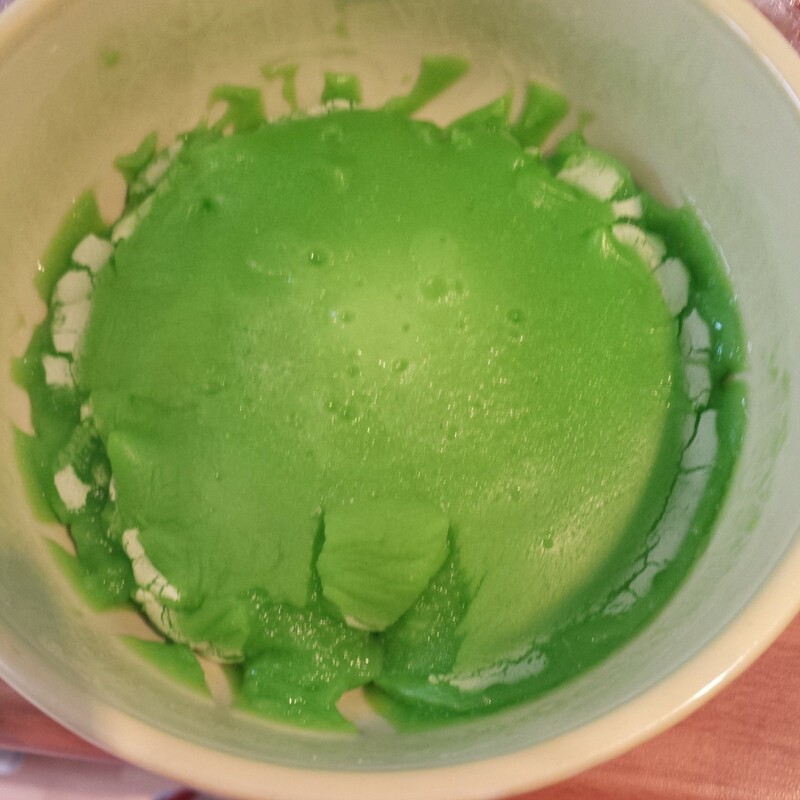 Pandan cake is usually green because of the chlorophyll from the leaves but as the leaves aren’t readily available everywhere most Pandan essences contain some bright food colouring to help recreate the glorious green sponge at home. 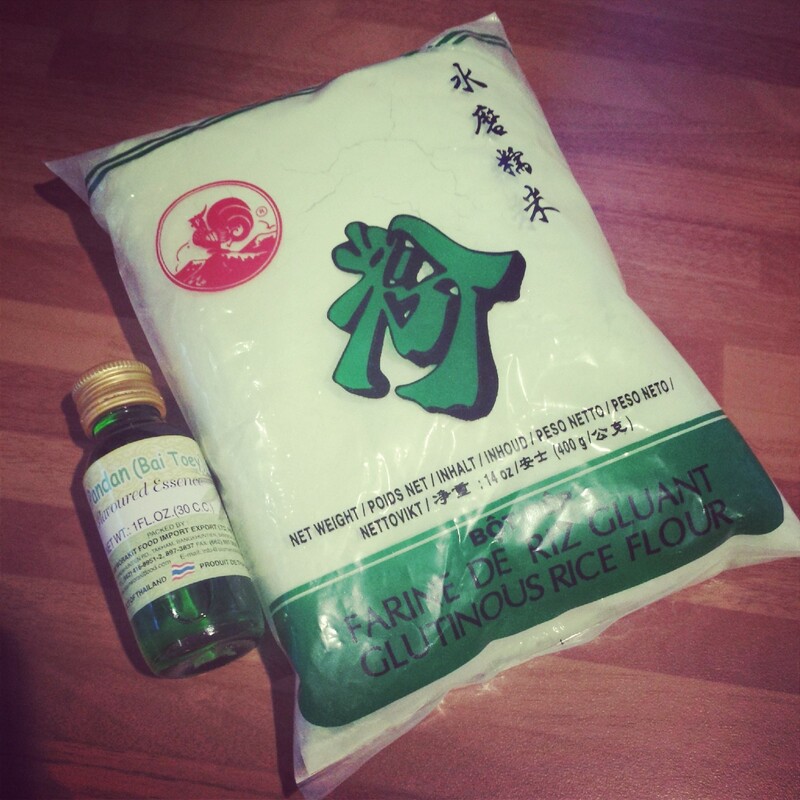 In search for Pandan paste I found Pandan essence and Pandanus Glutinous Rice flour which contained the elusive Pandan extract. As rice flour behaves in a slightly different way to normal plain flour I had to modify my recipe to accommodate the changes. You don’t have to use the green flour if you can’t find it. You can use self raising or plain. But if you prefer gluten free go for rice flour. 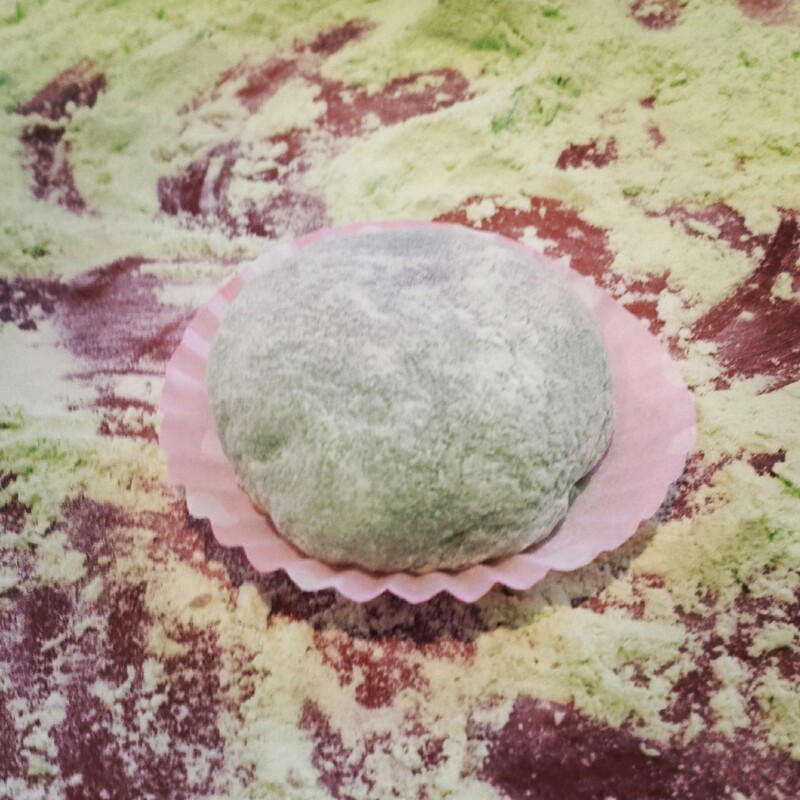 Glutinous rice flour (despite it’s name) is gluten free. The glutinous bit means the rice belongs to the sticky rice family. 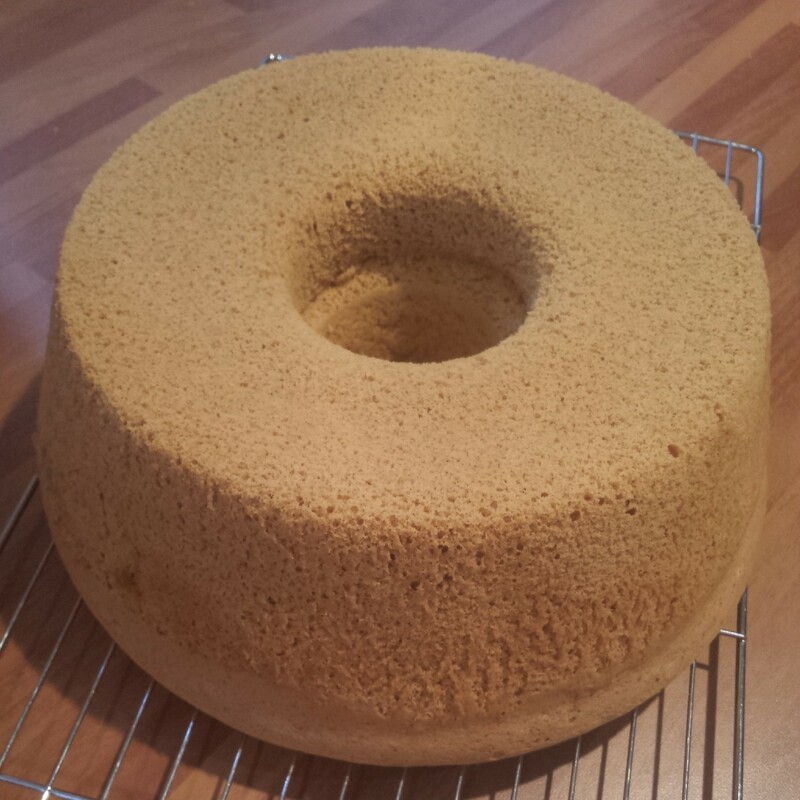 Now upon extra research I realised that this is a chiffon cake. Those Great British Bake off fans will remember this as one of the technical challenges that was a bit tricky to bake! And considering my oven’s unpredictability this may not be the best choice to bake for our first Clandestine Cake Club gathering of 2014. But I do like a challenge! 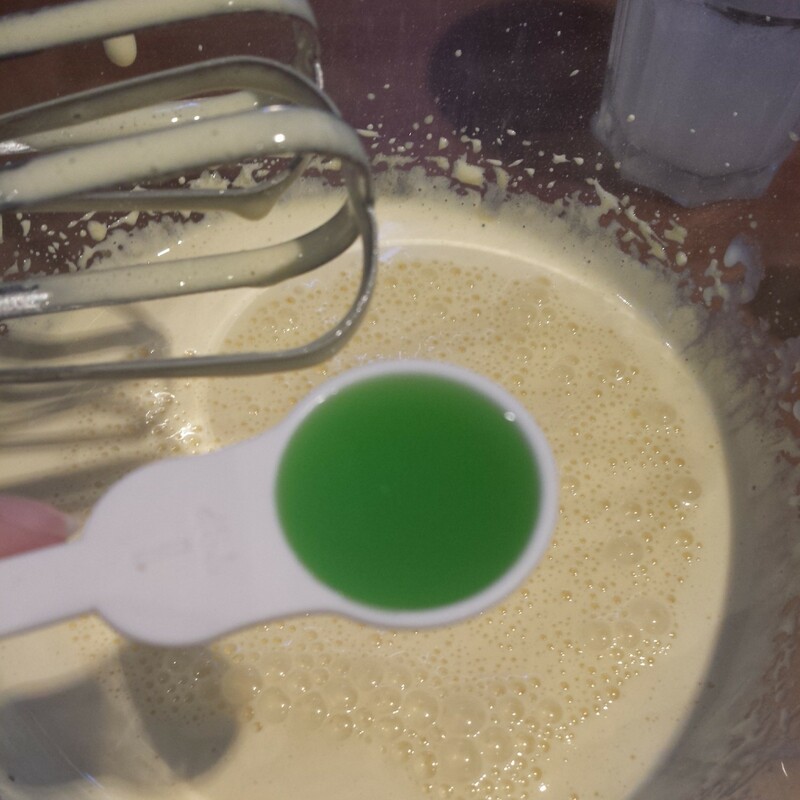 Whisk in the coconut milk along with the pandan essence/paste/extract. If you’re worried it’s not going to be green enough add a dot of green food colouring gel. 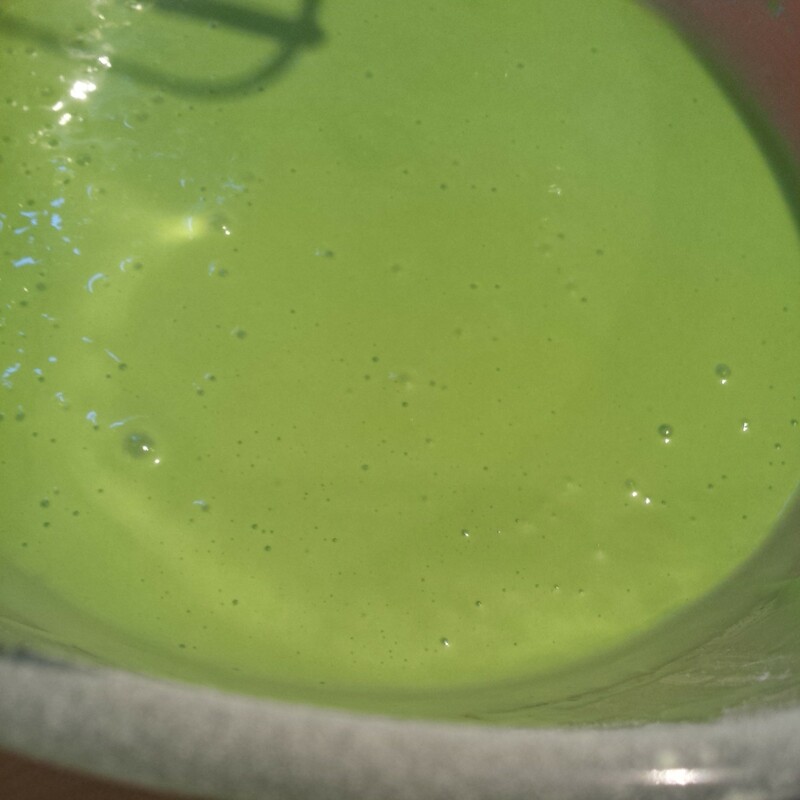 It will soon become a frothy fluid batter with a green tinge to it. Sift in the flour ( whatever type you prefer) along with the baking powder and bicarbonate of soda. 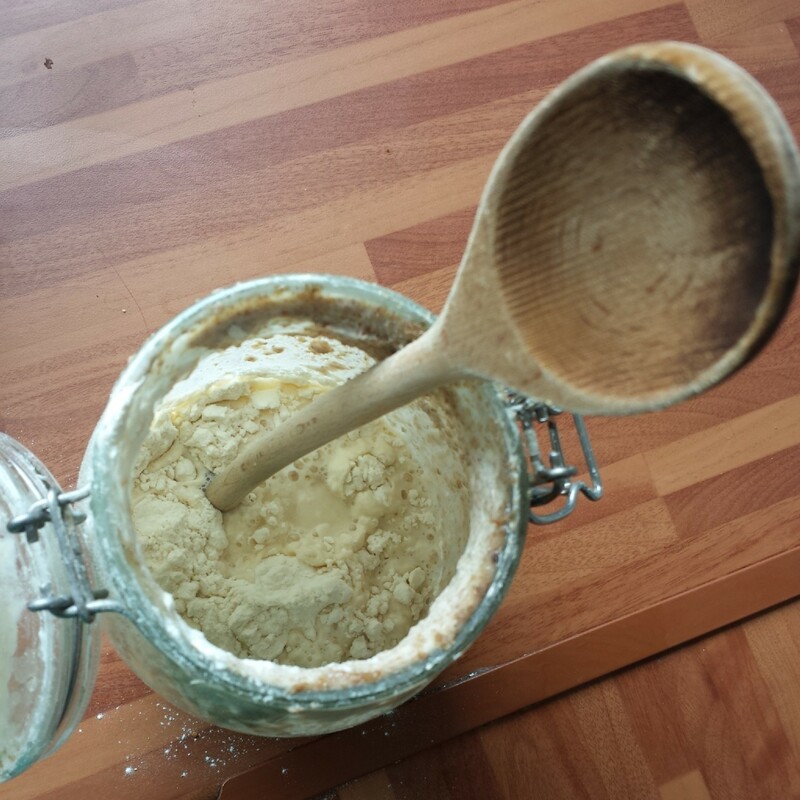 If using self raising flour you will not need as much raising agent. 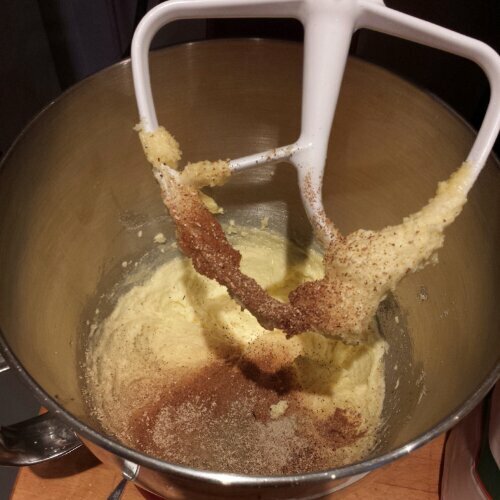 Whisk a third of the flour into the batter followed by a third of the oil. Repeat until it’s all combined. 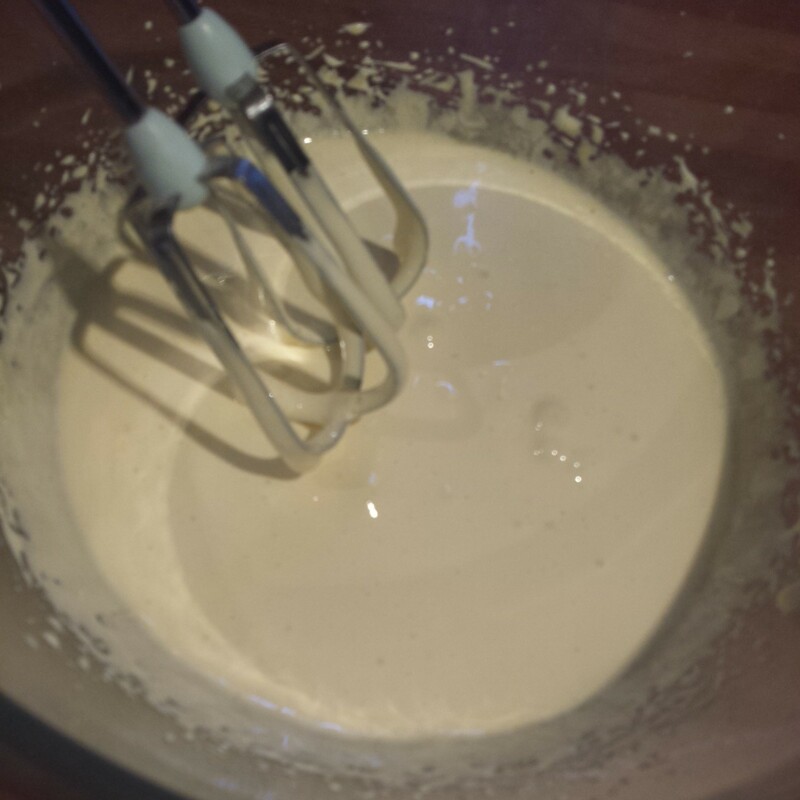 Whisking in the glutinous rice flour – How bright is the batter! 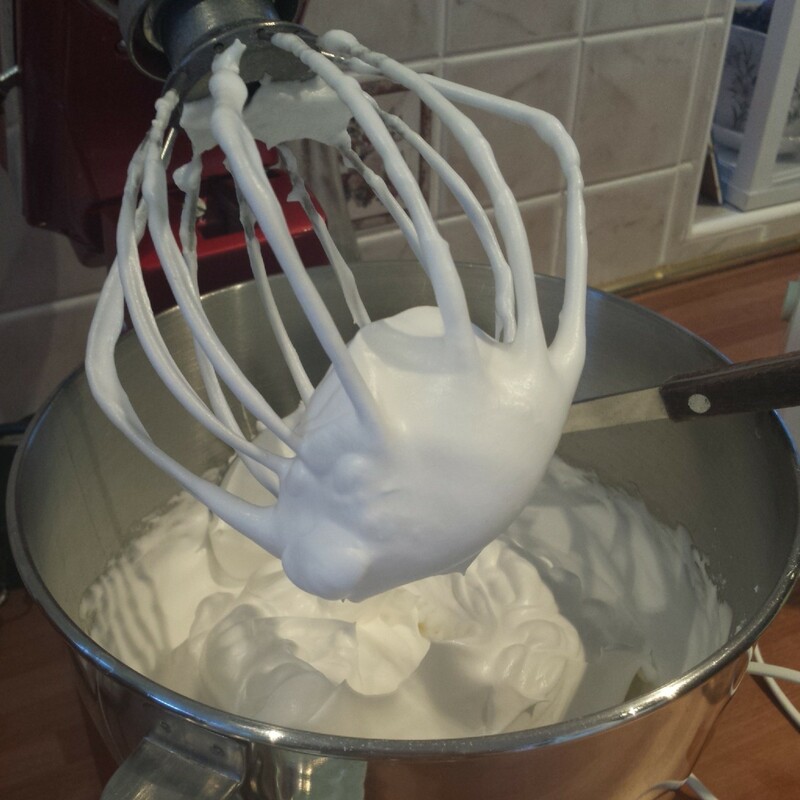 Whisk the egg whites until frothy. 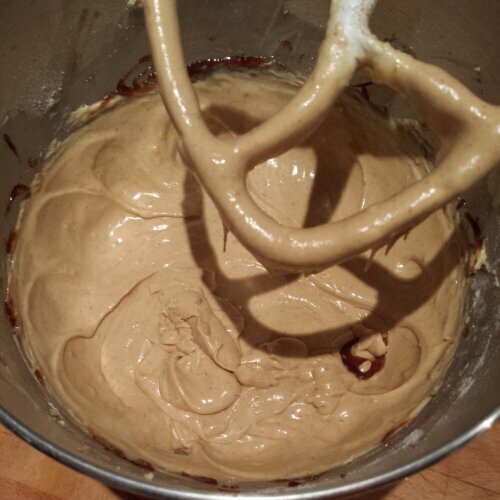 Then gradually add 100g of sugar and continue to whisk on high until stiff peaks form. 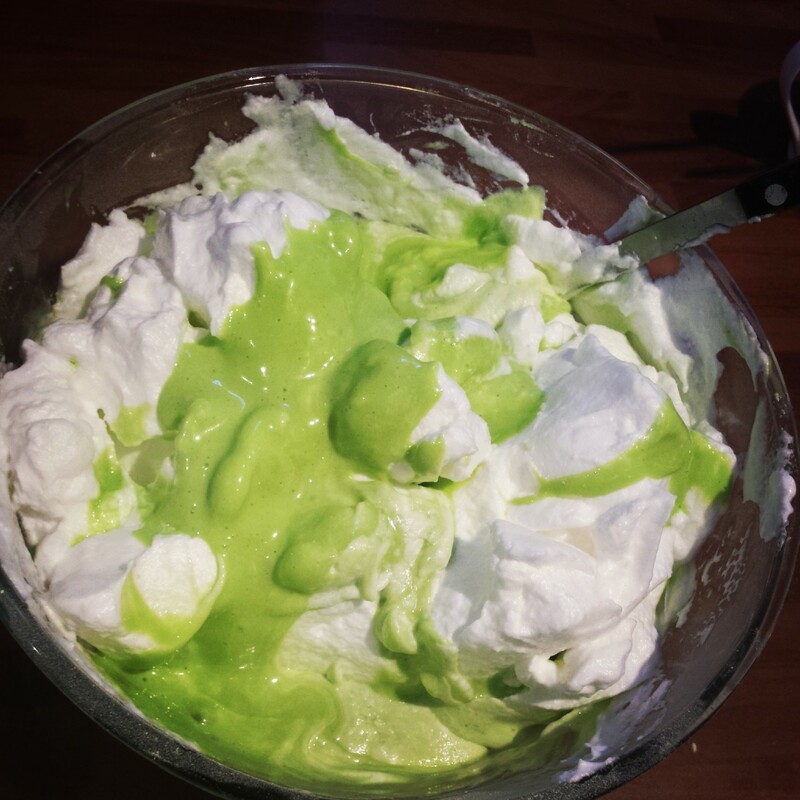 Fold a dollop of egg whites into the green batter to loosen the mix and then carefully fold the egg whites in to preserve the air in the mix and help the cake rise evenly. 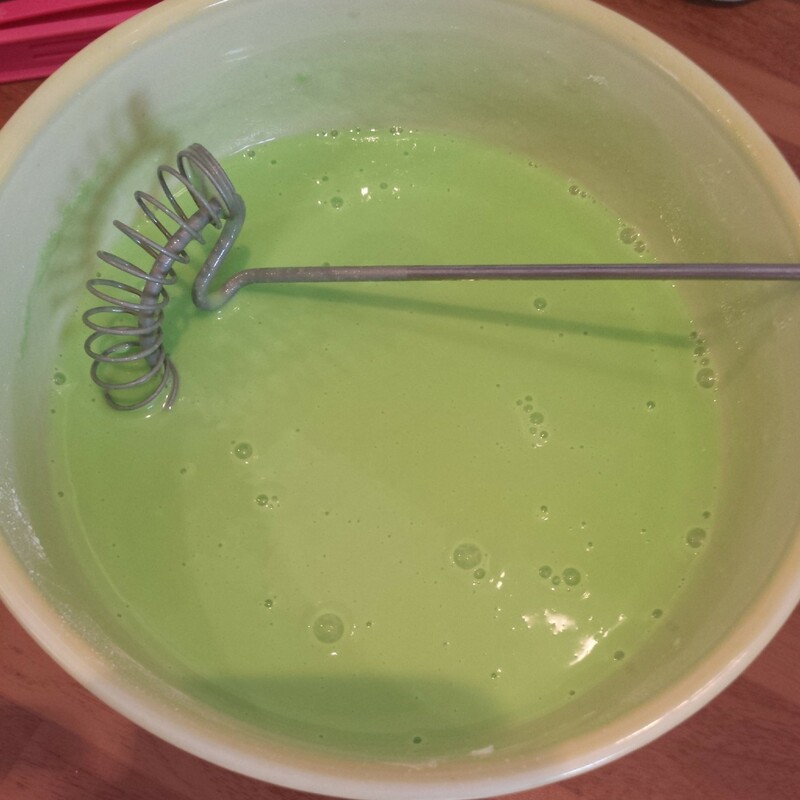 Carefully fold in the egg whites – Love how green the batter is! 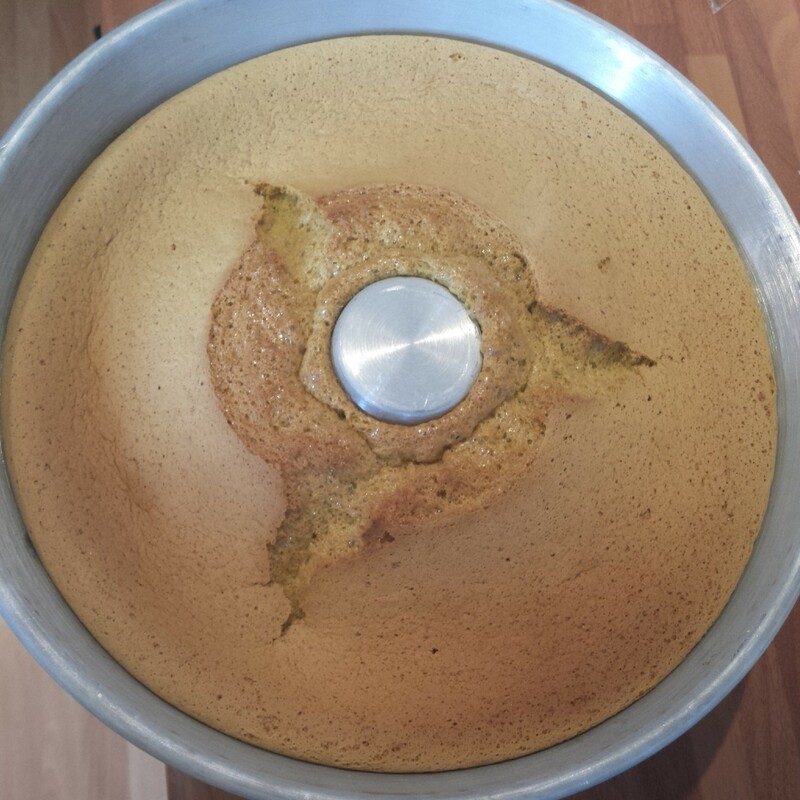 Now with all that wonderful air in the cake the sponge springs up magnificently in the oven almost escaping the tin. 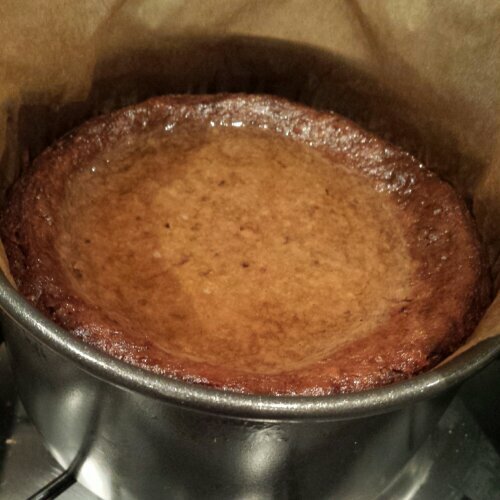 With the hole in the middle the cake will cook quicker and more evenly which can only be a bonus in my oven. 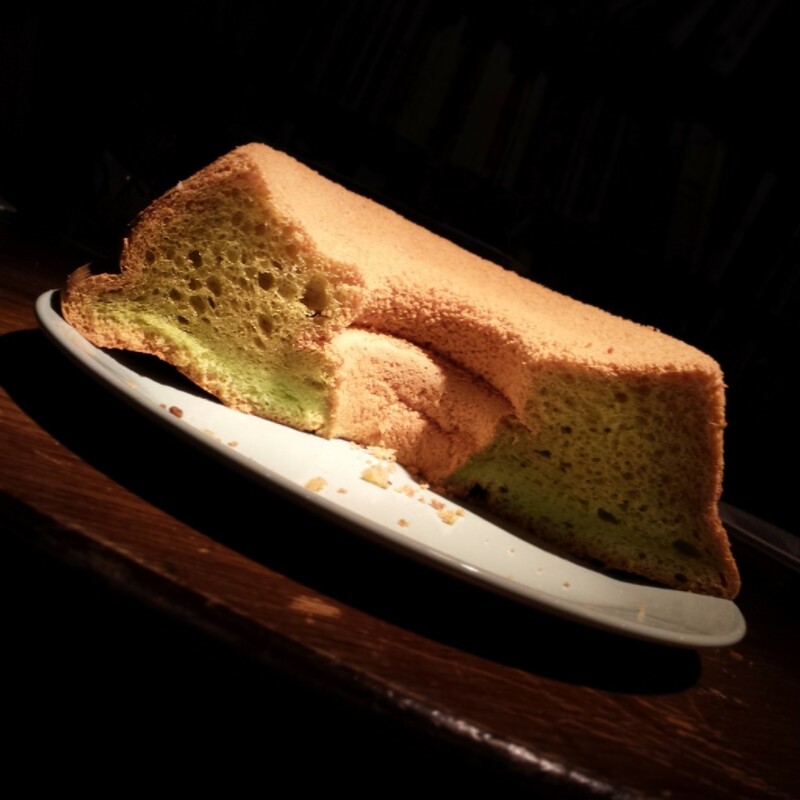 The enormous Pandan Chiffon Cake! You will need to keep an eye on the cake to make sure it doesn’t burn. Bake it for 50 mins at 160 degrees c ( fan) but if it is cooked through sooner take it out (or leave it longer if it needs it.) I made the mistake of sticking cocktail sticks into the cake too often to check that it was cooked. This meant I deflated the cake slighty. Also pausing to mess around taking photos of the cake meant that I didn’t invert the cake tin quick enough and to my horror saw the cake sag down inside the tin. You can see on the cooled cake that it has a little ridge around the bottom of the cake (a bit like a muffin top over spilling someone’s jeans). 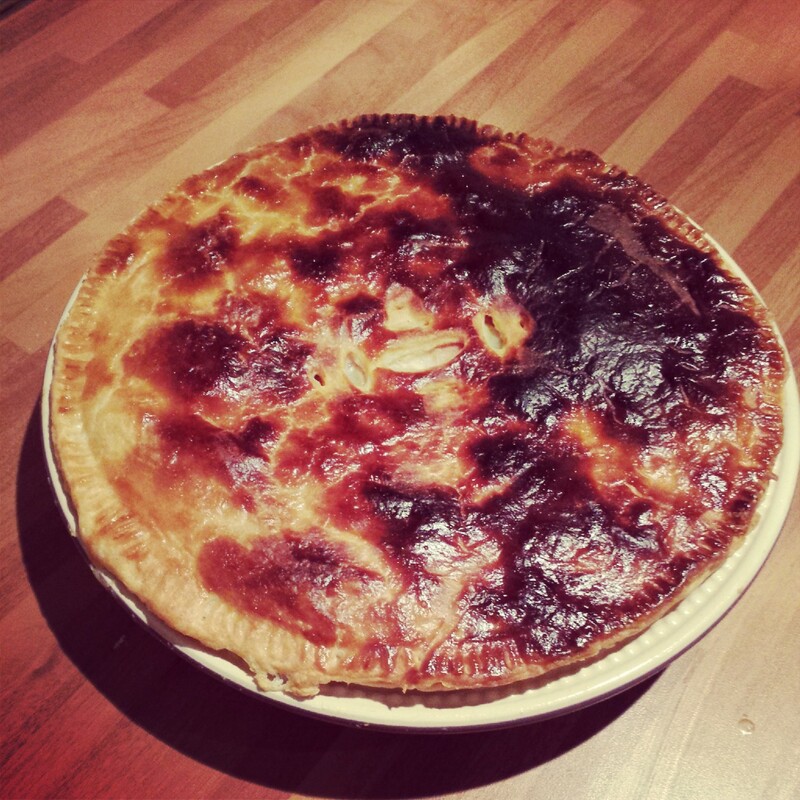 Note to self: check it’s cooked and tip the tin upside down immediately when taking it out of the oven! 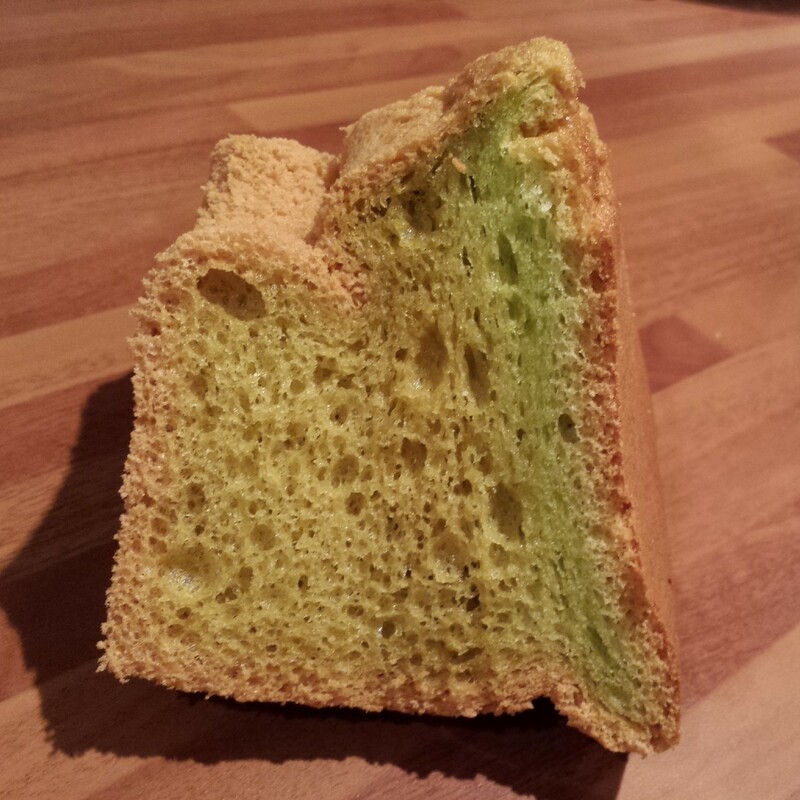 Despite it’s slightly saggy ridge the Pandan Chiffon Cake was amazing! 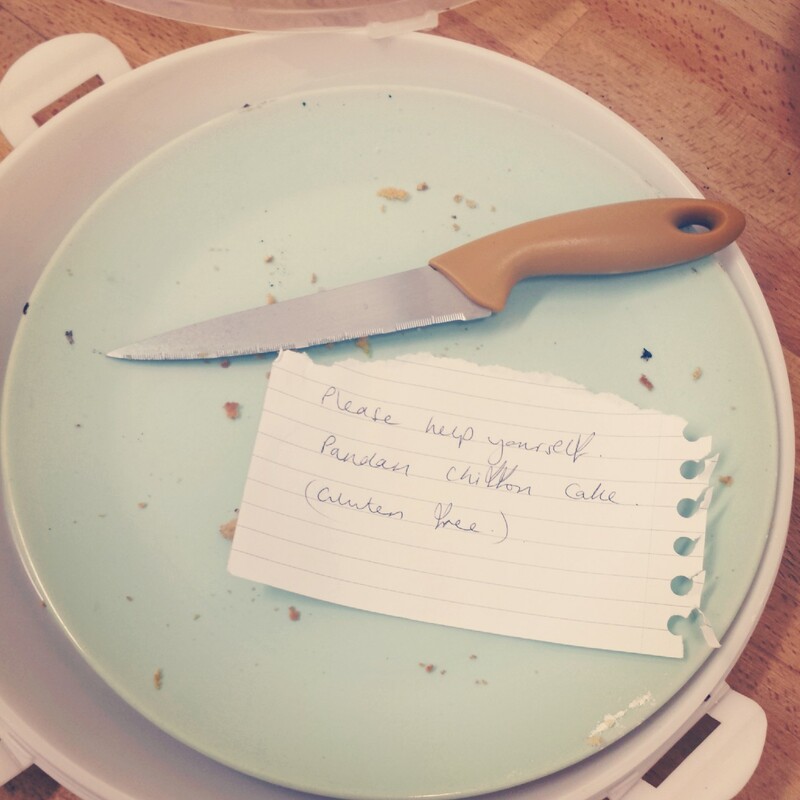 Once the cake cooled completely I found that it didn’t slide out of the tin as easily as I had hoped, as the cake was clinging on a little too tightly to the tin. I coaxed it gently out of the tin using a sharp knife and running it around the edge of the tin, allowing gravity to do the rest of the job. This meant that the cake didn’t have a shiny finish to it, but I think this is how it’s supposed to look. 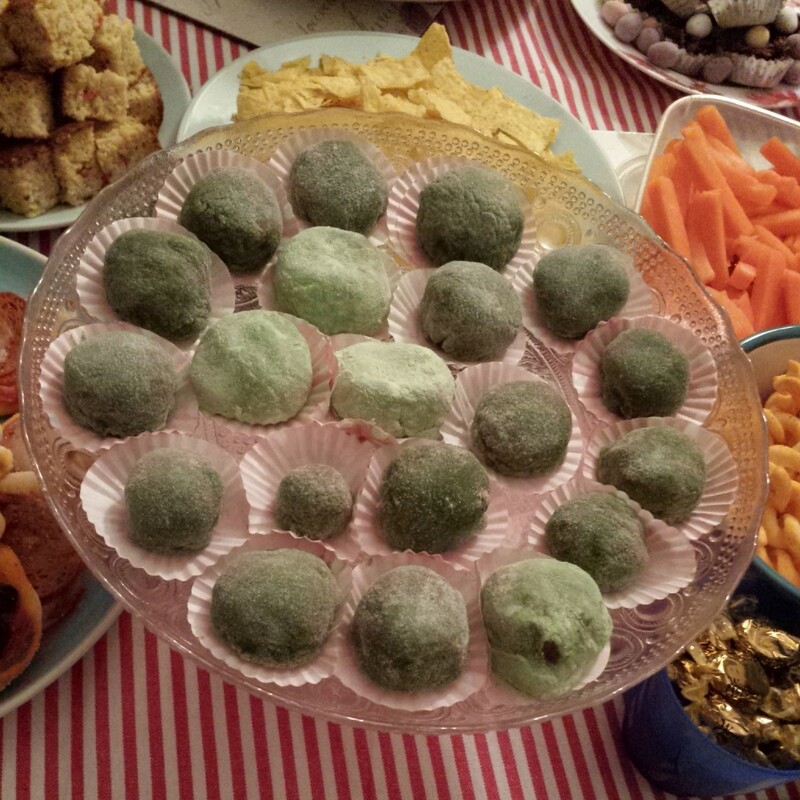 Pandan is an unusual flavour. It perfumes the air whilst managing to taste both sweet and savoury at the same time. 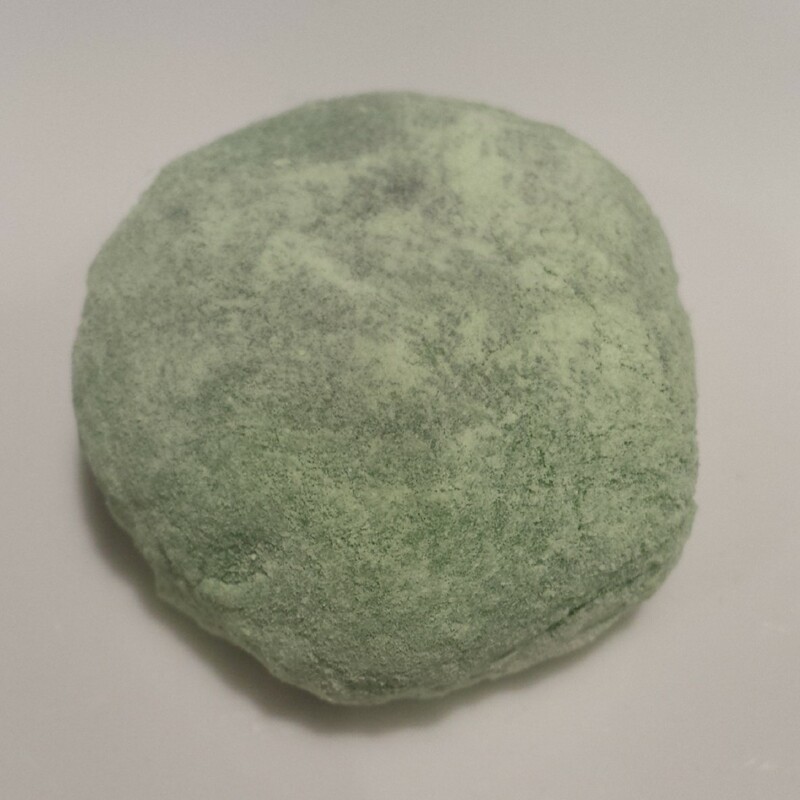 It’s similar to Green Tea (Matcha) cakes but like nothing else that I’ve ever tasted before. I will surely be baking this again. It really doesn’t take as long as you might think, perhaps 30 minutes to prepare and as it doesn’t need any dressing up, you don’t need to spend time decorating the cake. Icing would be overkill. It’s a deceptive cake. It looks rather plain and boring from the outside, but that first slice releases the pandan perfume and the glorious green chiffon . It’s a much more complex and interesting cake than you might initially think. 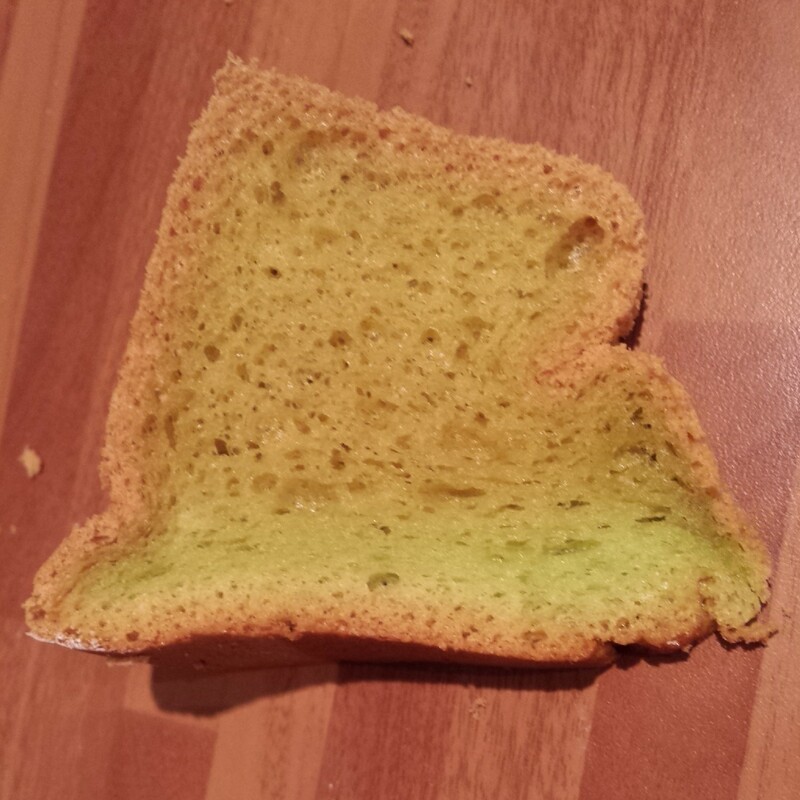 If you’re going to attempt an exotic cake I can’t recommend the Pandan Chiffon Cake enough! January has been a busy month filled with baking and frustration with the new-to-me-yet-old-to-our-house oven which has no temperature or oven settings remaining on it. Leaving the delicate science of oven temperature in the lap of the gods or in my case the sizzle of the grill. set fire to my oven gloves and a pan lid! and sobbed silently at the oven window glued to my newly purchased thermometer checking the temperature hasn’t yet reached ‘towering inferno stage’ and frazzled my Madelines. I must admit I considered throwing the fiery beast in the bin, but the bin isn’t quite big enough… so back to patiently burning my cakes and starting over, and over, I went. I guess this oven is a bit like baking with an Aga? (Having never used an Aga I may be making this up) I put my limited Aga knowledge to good use and attempted to control the heat by placing extra baking tins in the oven, to protect my precious cakes from the uncovered elements in the oven and ward off the extra hot spots. Adding tin foil hats to my cakes wherever possible to guard against the scorch. If you have any suggestions on how to bake in a small, yet very hot, electric fan oven please send them my way! Undeterred I continued and eventually managed to bake some edible and rather lovely cakes, although I had to admit defeat on some of the more delicate bakes. It seems I shall be baking only robust cakes and breads that can withstand the heat until I can get to grips with the animal in my kitchen. This month I’ve taken the opportunity to recreate some of my most favourite around the world in 80 bakes with a slightly new twist. Mainly that I have crammed as many international elements and Middle Eastern flavours that I could possibly think of into one cake. And the result? 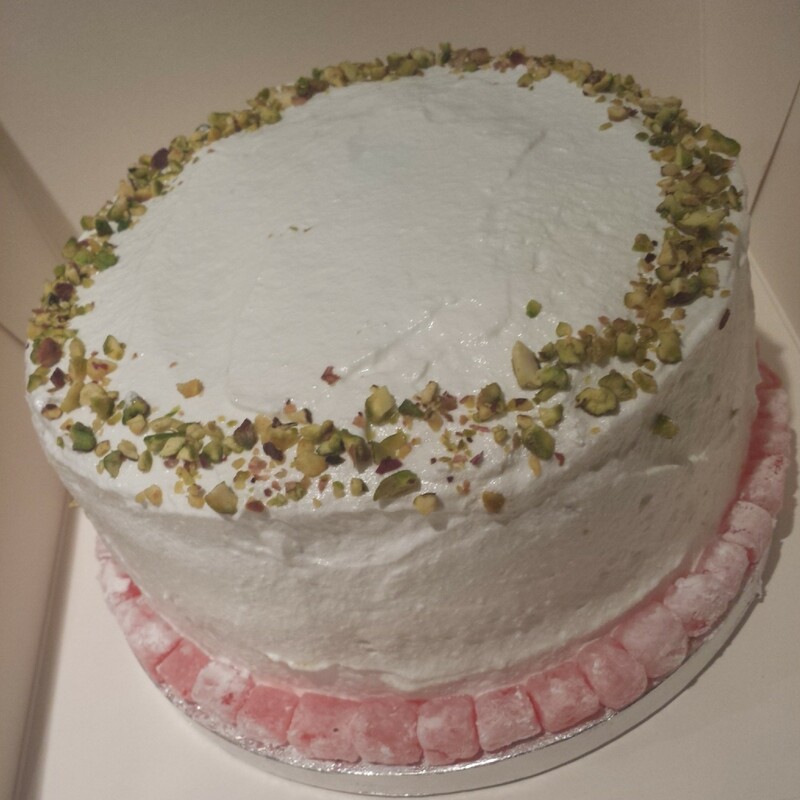 My 4 layer Iranian Pistachio Cake with cardamom; home made lemon curd, Turkish Delight and Rose Italian Meringue. Which means I finally conquered the ever elusive Turkish Delight using a very good Rachel Allan recipe. I even treated myself to 2 new cake tins that are the same size! Unheard of in my house, so now I can actually make cakes that sandwich together. Hurrah! I predict there will be many more layered cakes in my future. 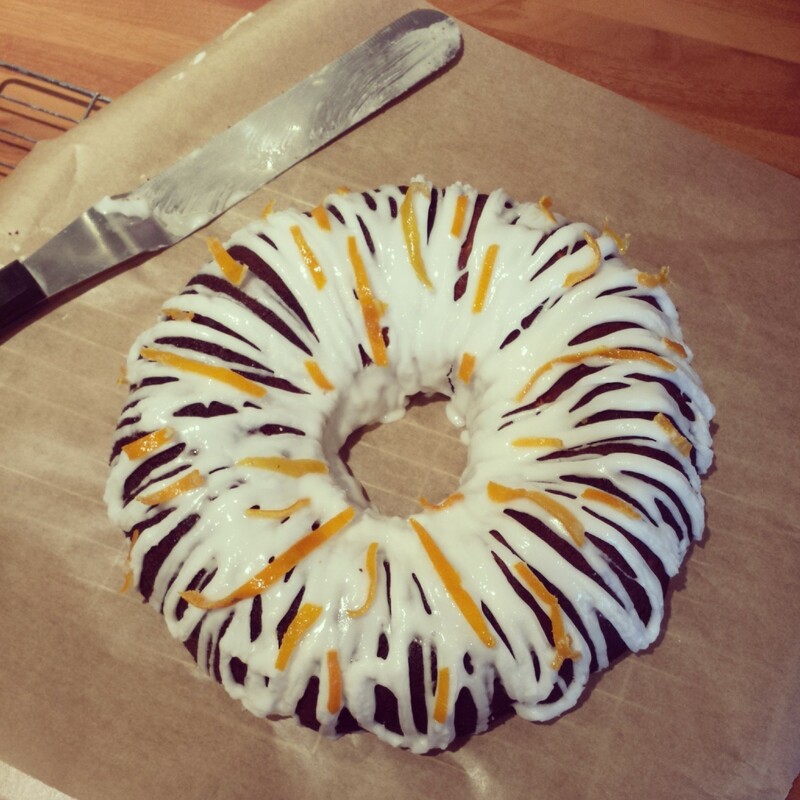 I also re imagined my Armenian Gluten Free Orange and Almond Cake into a bundt cake with ribbons of orange blossom icing and home made candied peel. Much less syrupy than my last attempt with thick piped glace icing which gave a great sweet contrast to the slightly bitter orange and almond cake. Thanks for reading and I hope January is treating you well. I’m looking forward to hopefully baking not burning some new and exciting international recipes very soon. 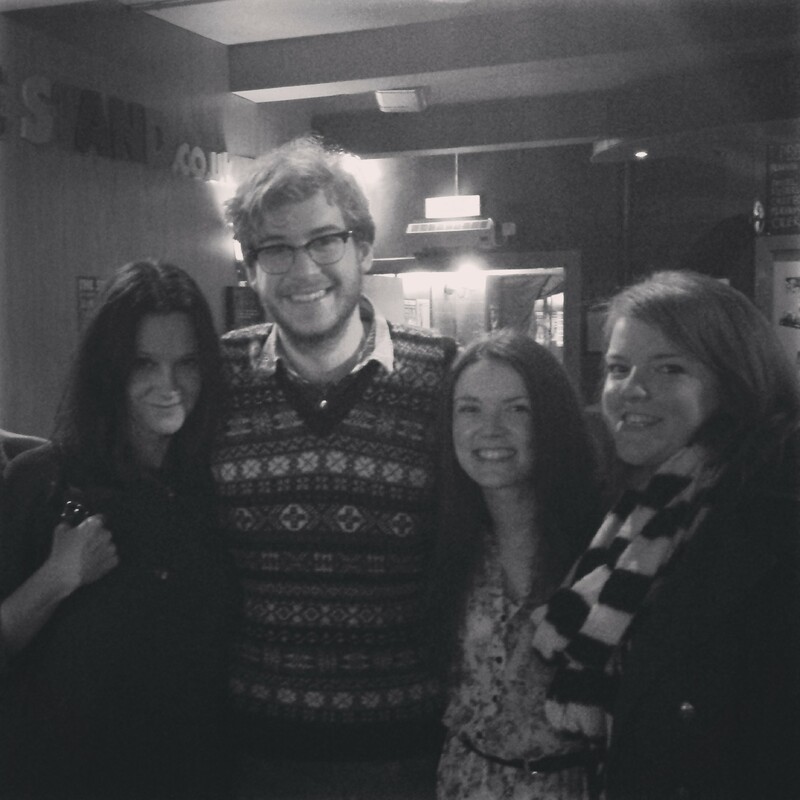 My friend Kate very kindly offered to drive us to Glasgow for James Morton’s ‘Stollen Moment’ show. Armed with James’s new book, a cheese board, a selection of homemade scones, sticky buns and a flask of tea we trotted off merrily to Glasgow to enjoy the show and meet the lovely Great British Bake Off finalist in person. What a great show. James patiently answered our questions whilst demystifing the art of bread and sourdough baking and making a lovely sourdough stollen on stage for us to sample. He explained how it’s not really scary and you don’t actually have to knead your bread all that much to get a brilliant loaf! You can prove it in the fridge and save your energy for more important things like eating the bread. Music to my ears. 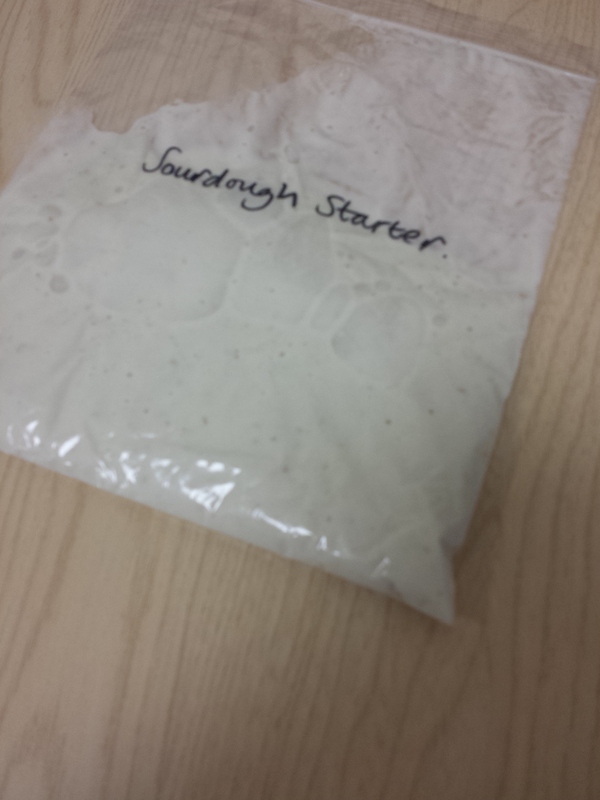 We even got to take away a bit of James’ sourdough starter home with us. My first attempt at sourdough bread where the lid has stayed intact! Check out that golden crust and even crumb! Success at last! Christmas morning breakfast. 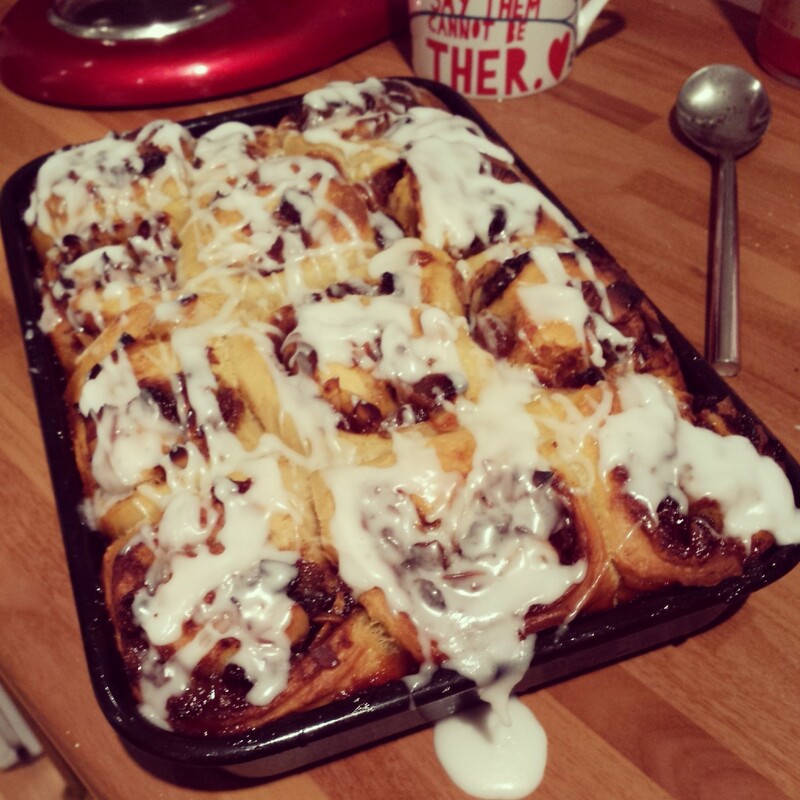 Sourdough mince pie cinnamon buns. They’re rather filling! Sourdough Starter bagged up and ready for sharing. 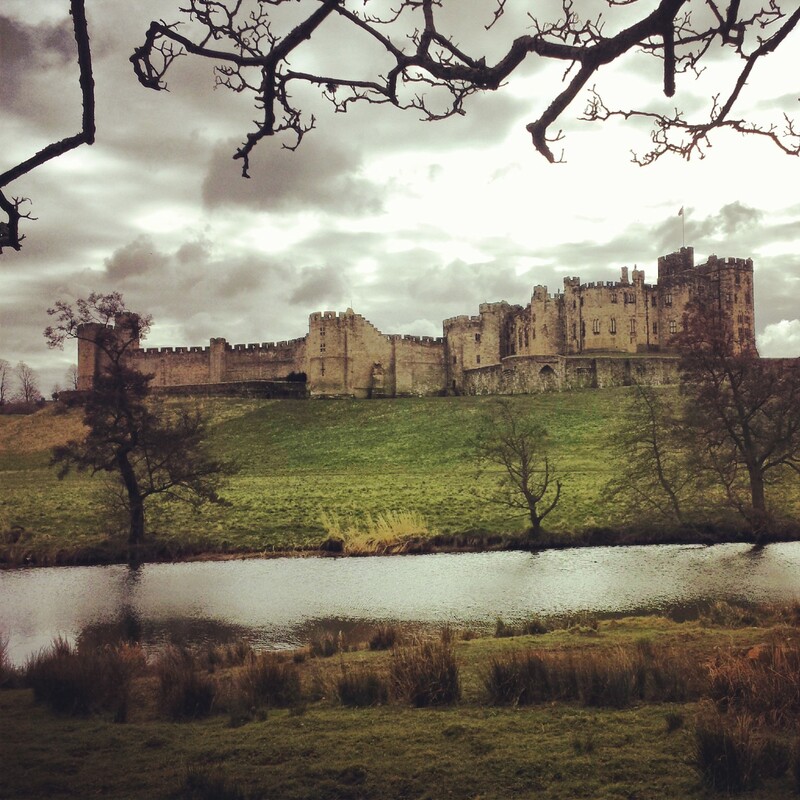 Apologies for my lack of bloggage over the last few weeks. I’ve been very busy, painting decorating and moving house, celebrating our first wedding anniversary (where has the time flown!?) and baking vast quantities of Christmas puddings and sourdough bread in all forms over the holidays. 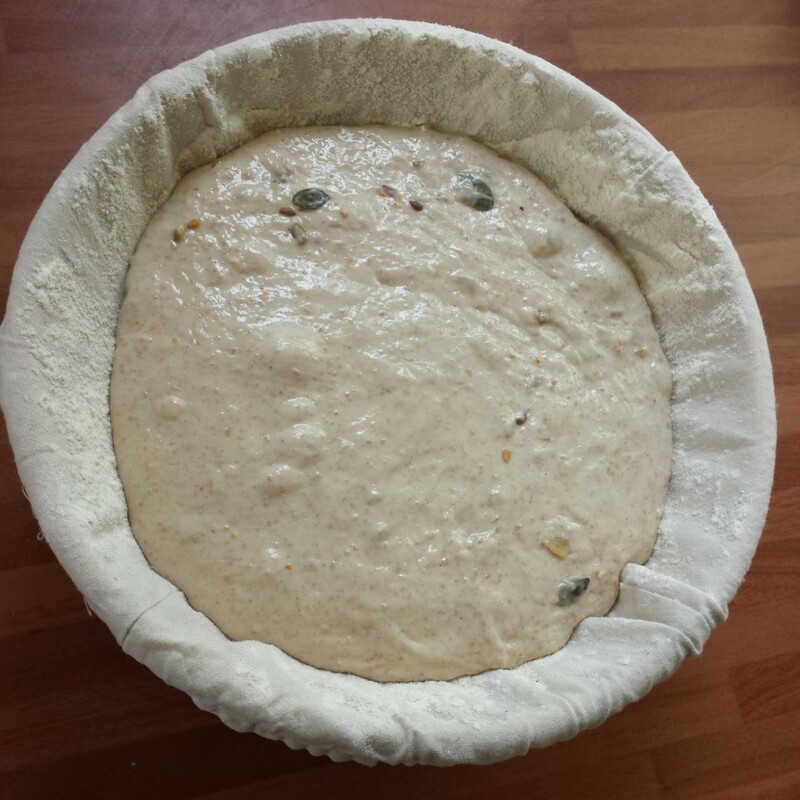 (Think rosemary foccaccia, wholemeal pizzas, buns, loaves and rolls!) The freezer is full of enriched doughs, mincepie rolls and scones. I can’t wait to try out the rest of the recipes. I think we’re going to need more flour! Phew! We managed to get into our new home just before Christmas! It’s already been a year since we got married! Happy first anniversary to us! It’s still going strong one month on! 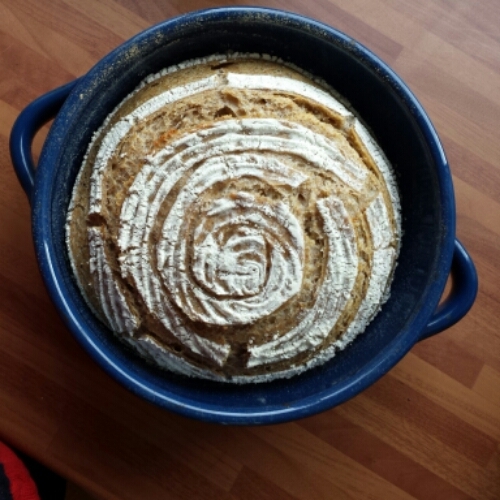 Since this post I’ve experimented more and created another sourdough recipe ‘Hot Pot Sourdough’ which also works a treat. 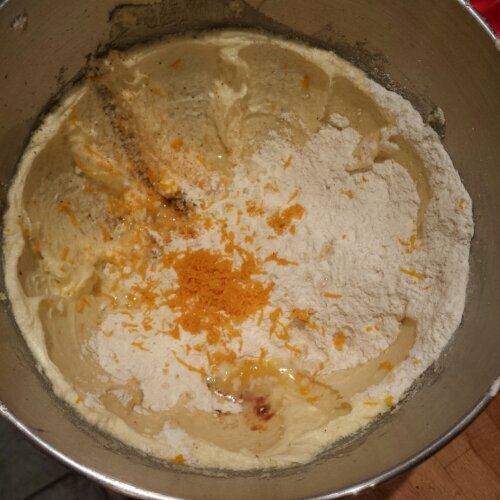 Knead the mixture together and allow to prove over night in the fridge. (Yet another life changing tip from James. 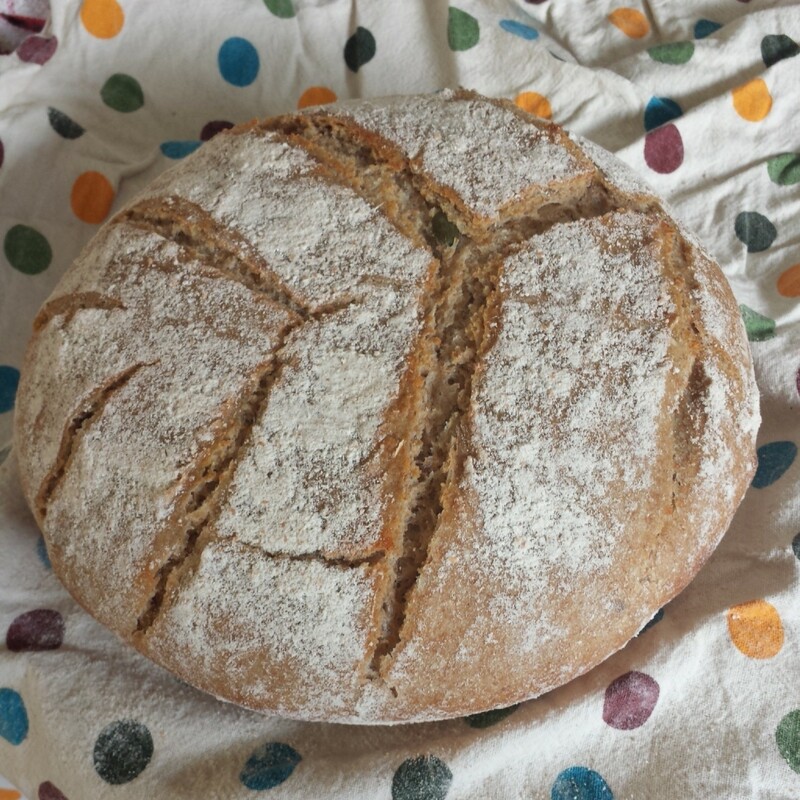 You don’t have to knead your bread very much if you leave it for a long first prove. Chilling it means the bread proves slowly and allows the bread to develop a more rounded sour flavour!) My fridge is now always filled with a loaf proving, ready for the next day. wrap in a tea towel whilst still hot, to soften the crust and eat with whatever your heart desires! Maybe, hot soup, butter, jam, nutella. Please note: I’ve taken elements from a couple of my favourite bread recipes here to make something that I know I and my oven can handle. It’s a slightly wet dough which compensates for the drier brown/wholemeal flours but not too liquid so it can be handled and shaped. I can’t recommend James’ book enough if you haven’t already bought it. I’ve learnt so much from it and I’ve only read the introduction and tried a couple of recipes so far. (And I haven’t been paid to say that!) 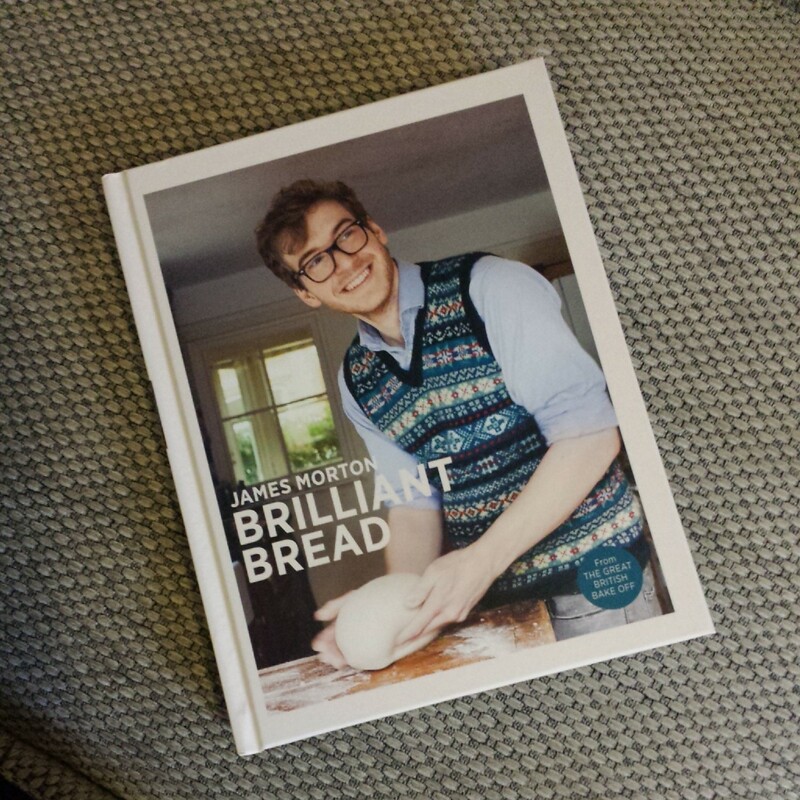 I’m still yet to master some of the more advanced bread recipes in James’s book but I’m enjoying practising and getting a lot of dough up the walls and in my hair in the process. Happy New Year! Thanks for reading my blog! I promise there are more international bakes to come as soon as possible once I’ve got the hang of my new oven which unfortunately no longer has the temperatures on the dial! An oven thermometer is winging it’s way to me now as I type. 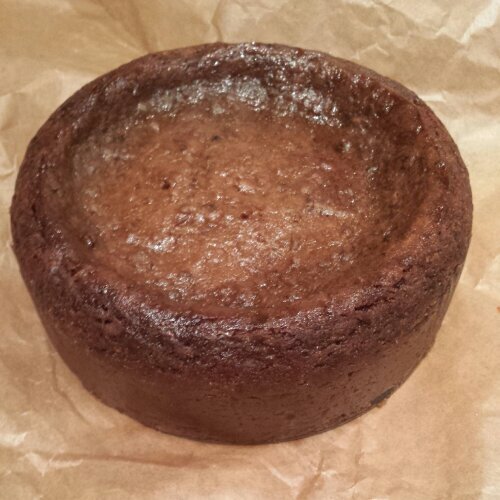 Just the one Jamaican Black Cake – with extra booze! Not satisfied with creating a Jamaican Black Cake containing 3 bottles of rum AND a bottle of Brandy, I have returned to my original recipe to see if I can improve it even further. 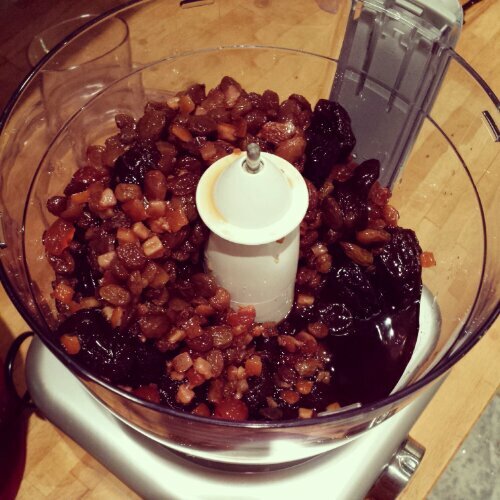 It was such a success when I made it 2 years ago I wanted to make an extra special Christmas Cake and as the festive season is almost upon us now is the perfect time to start soaking the fruit in lots and lots of booze! This cake does take a little bit of planning and preparation. I wanted to use spiced rum in the cake as a slightly different alternative to my last cake, but stumbled at the first hurdle. The shop keeper wouldn’t sell me the massive bottle of booze without my ID which was sat at home. The shop keeper wasn’t budging despite my protestations that I’m 30 and have my marriage certificate with me and that I wasn’t even going to drink the rum it was for my cake! Determined to secure my spicy rum I came back with my license and all was well! 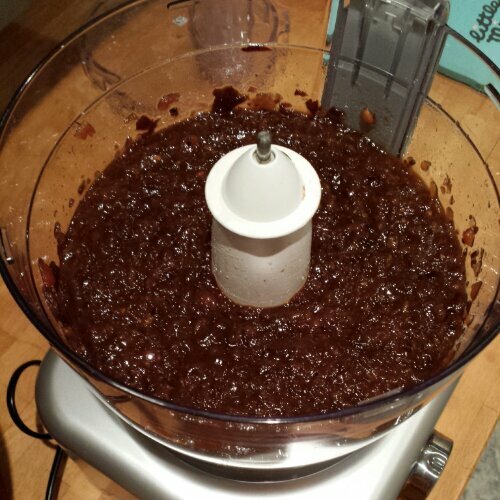 The dried prunes, sultanas, cherries and mixed peel fruit needs a good long soak to absorb as much liquid as possible. I soaked mine in the rum, brandy and angostura bitters for 2 weeks, but if you’re in a hurry you could soak it for 3 days. Now with this much more sensible amount of fruit and booze I could easily fit it into my food processor bowl without it overspilling. The fruit is much softer after the addition of the booze but there will still be a little rum left that isn’t absorbed, pour the whole lot in and whizz it up into a smooth – ish boozy fruity pulp. There will still be some texture to the fruit which will give a wonderfully moist and keep the cake texture interesting in your mouth. 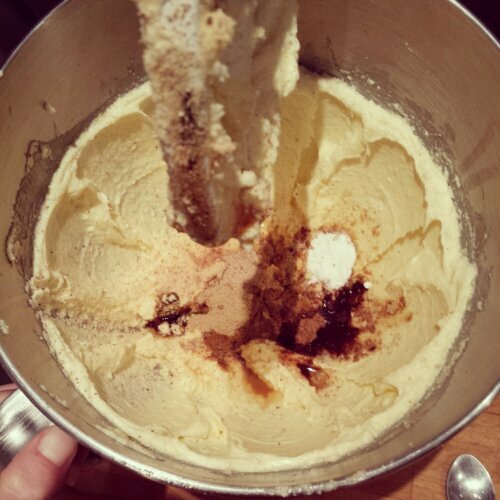 Beating the butter and sugar together vigorously until it’s light and fluffy adds extra rise to the cake. I like to beat mine until it’s softer and increases in volume. As there’s spice in the rum, adding more spice here gives an even richer flavour to the cake which matures with the cake the longer it is kept after baking. I added cinnamon, nutmeg, ginger, vanilla paste, almond extract and lime juice. Yum! 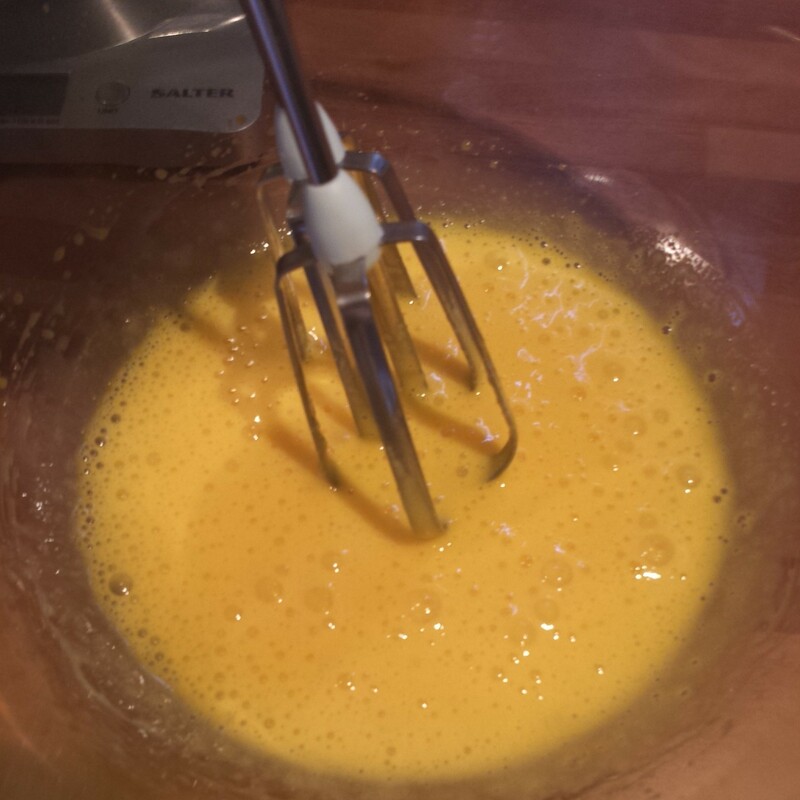 Once the eggs are beaten into the mixture, one at a time, until the mixture increases in volume and is light and fluffy, the dry ingredients can then be folded in. I didn’t have any limes in my house so I grabbed the only orange that I had left, any citrus fruit would work well, but limes are the traditional fruit to use. 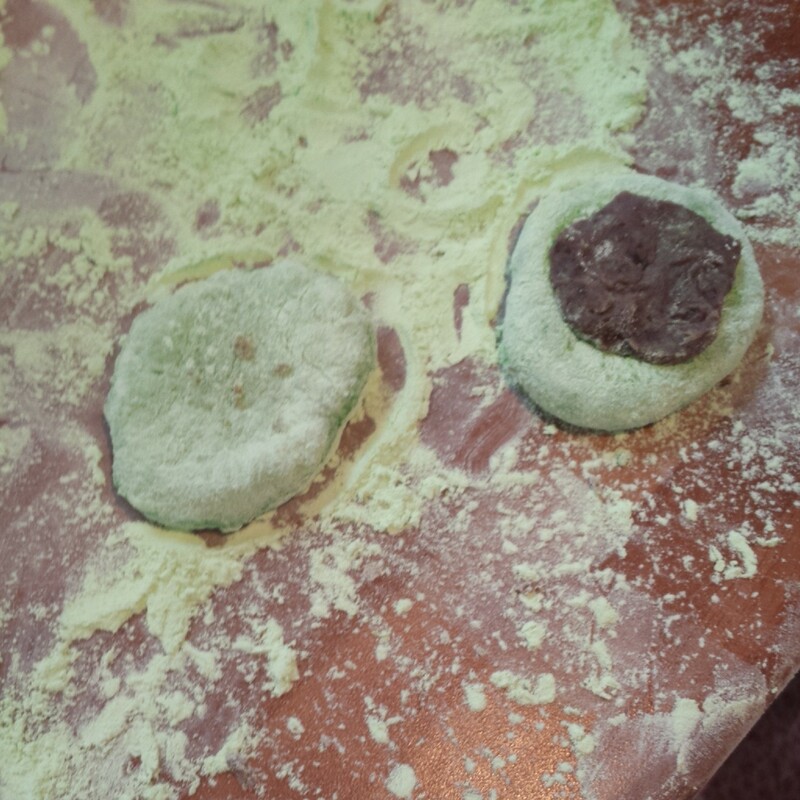 Fold in the flour, baking powder and zest. I’m lucky that I have a Kitchenaid mixer, so I can leave it running whilst I busy myself with the next steps. If you’re using a hand held mixer or beating things by hand, I’d recommend keeping an eye on the sugar as it browns to stop it from burning. I almost burnt mine! Heat the brown sugar in a heavy pan until it melts. Don’t stir as it will crystallise! Swish the sugar around in the pan as best you can by tilting the pan to combine the sugar and the liquid together. 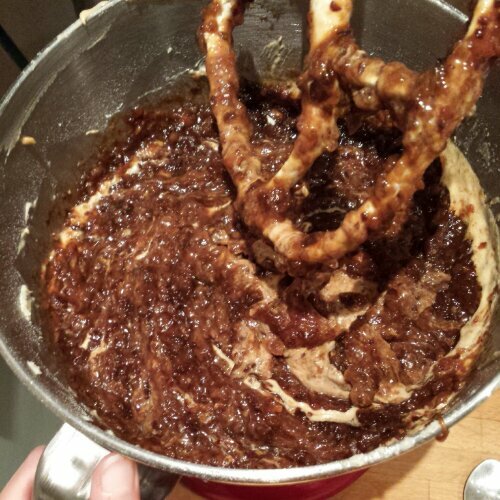 As it melts, gradually add a tablespoon of boiling water and allow the sugar to dissolve into a dark caramel. It might erupt like a volcano in your pan if it’s too hot, so be careful. Once it’s browned (and almost burnt) take it off the heat and allow to cool slightly before beating it into your butter and egg batter. With the browned sugar fully incorporate the batter becomes wonderfully brown and shiny. It smells amazing too! Long gone are the days where I’m trying to mix enormous vats of cake mixture! I could actually fit all of the batter and fruit into my mixing bowl! Hurrah! It takes a little bit of manoeuvring and scraping down of the sides of the bowl to ensure all of the fruit purée is folded in evenly. Once fully incorporated, the batter is wonderfully golden brown with flecks of fruit peeking through. It tastes delicious too! (I couldn’t resist licking the spoon!) The kitchen had a glorious glow from the rum and my cheeks were rather rosy by this point too. This is perhaps not a cake to eat and then drive home afterwards. Despite having reduced this recipe down I still ended up producing 2 cakes! 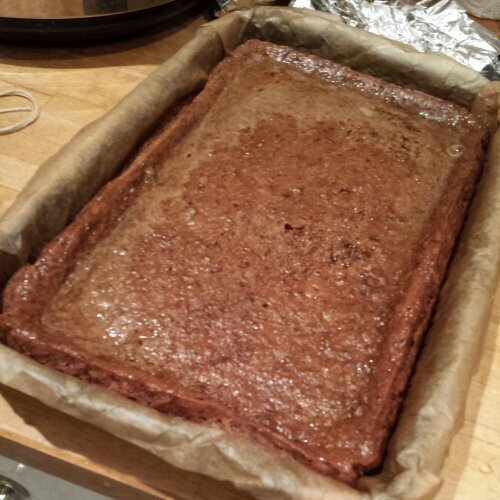 I wanted to bake a rectangular Jamaican Black Cake, so I can cut it into chunks to give as Christmas presents.This is a brownie pan about 8 x 4 inches. 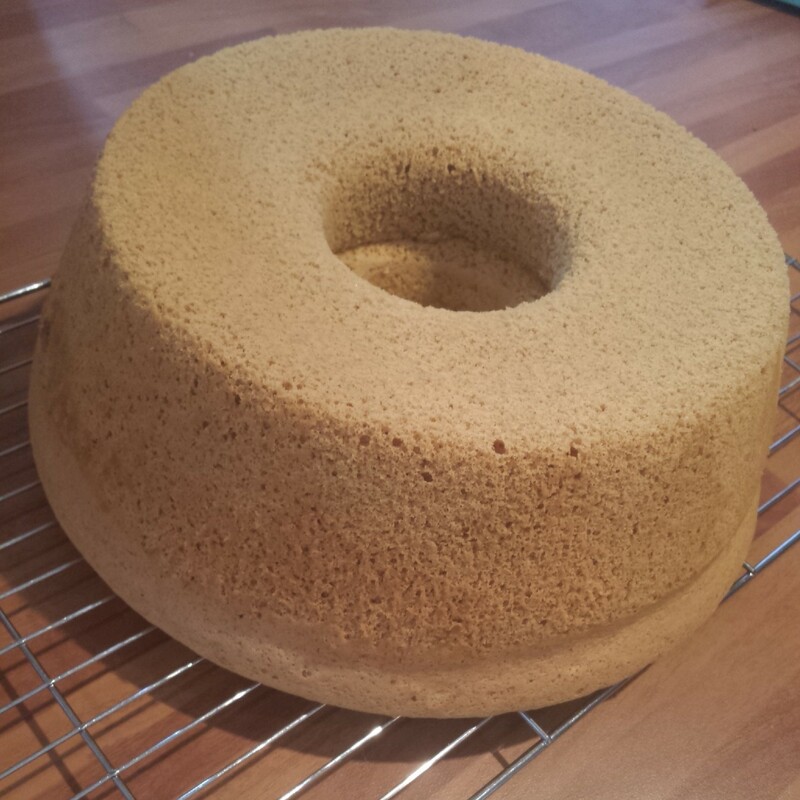 I also had enough batter to bake a 6 inch round cake too. My guestimate would be this recipe would work well as one 9 or 10 inch round cake too. The tins need to be doubled lined to help protect the cake from the heat and bake it gently over a few hours. This is easier said than done with a low sided rectangular tray. I gave up trying to double line the bottom of the tray and sides, instead opting for a tin foil lid, which worked really well. No burnt bits in sight! I can safely say that having sampled a slice last night this cake lives up to it’s previous promise of rosy cheeked deliciousness. It’s very moist (I may add pour less rum over the hot cakes next time) but I’m sue this will help to keep it moist ready to be dished out on Christmas Day. 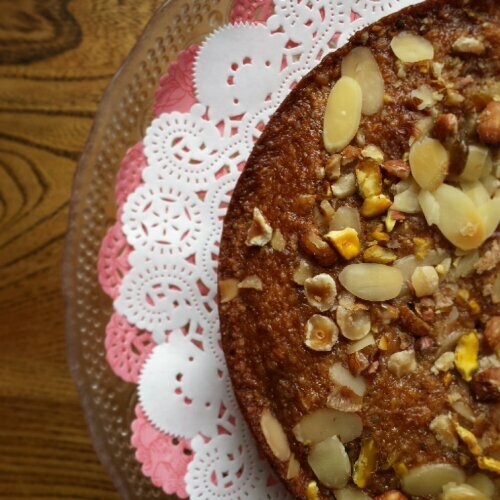 It has everything a spicy , boozy, celebration cake should offer. It’s warming and rich. Perfect with a glass of fizz (or I ate my piece last night with a cup of tea and glass of red wine.) Delicious! Soak dried fruit in the booze for at least 48 hours or up to 2 weeks. Blitz into a puree with a food processor. 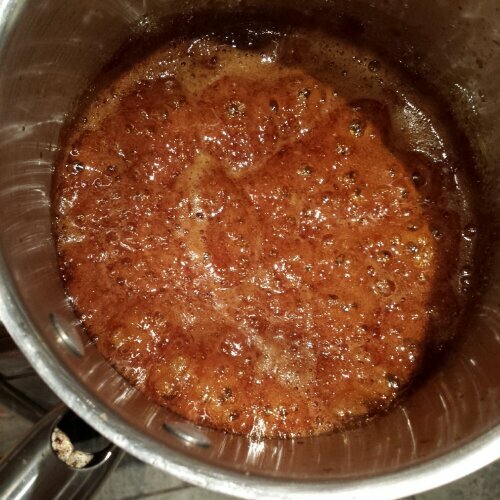 Heat the sugar in a heavy based pan until it melts and then add a little bit of the water at a time until it becomes a dark caramel. Careful not to burn it, but it will come very close to being burnt to achieve ‘browned’ perfection. 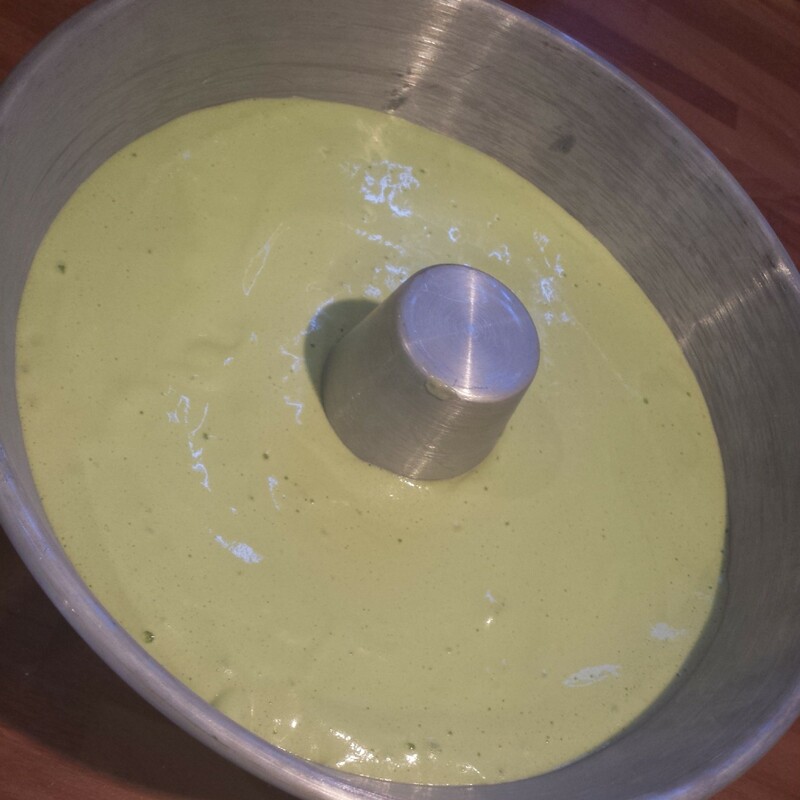 Pour the cake batter into a greased and lined tin. You could use a 9 inch round tin or a bundt tin. For this recipe I used a 4 inch round tin and a 9 x 4 inch rectangular pan. Cover with greaseproof paper lid. Pour 100-170ml bottle of dark rum for pouring on the hot cakes whilst still in their tins. Leave to cool in the tin. Gradually add the rum until you have fed your cake 170ml in total. It should absorb rather a lot of rum at this point. The cake will get darker with the more rum that you feed it. It may take up to a day for the cake to absorb the rum but it will get there. Wait until the cake has cooled completely before removing it from the tin. 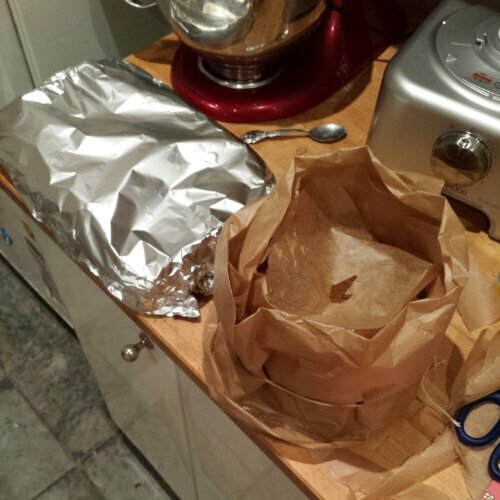 Wrap your cake in a layer of greaseproof paper and a layer of tin foil to prevent air getting in. Store the wrapped cake in an airtight container. The cake should keep for (at least) a month or even up to a year with this amount of booze going on in an air tight container. this cake also freezes really well. 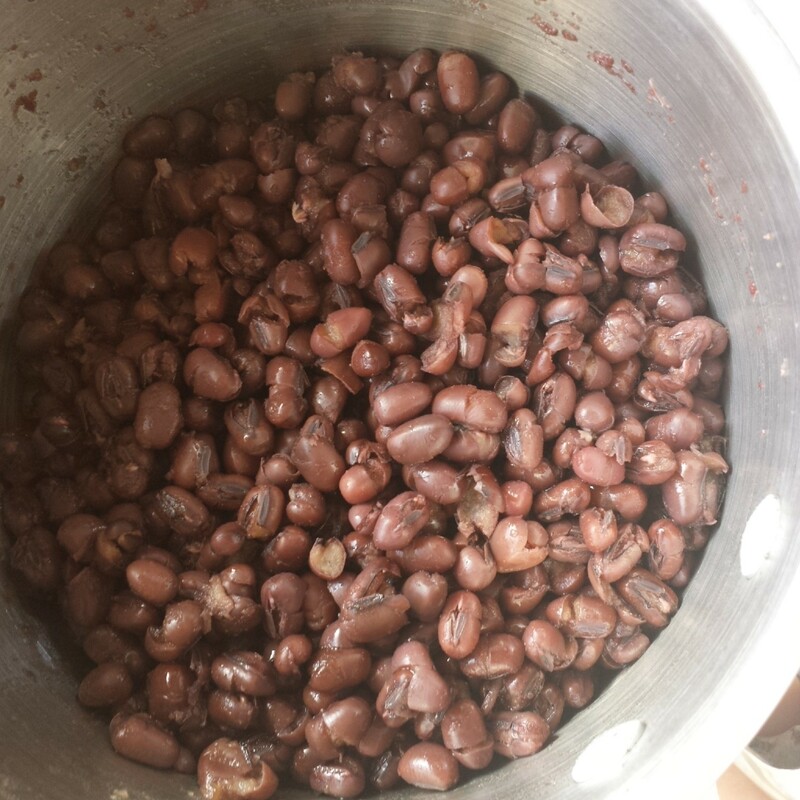 It will keep for at least a month in the freezer and the freezing helps to speed up the ‘maturing’ process to deepen the flavours. 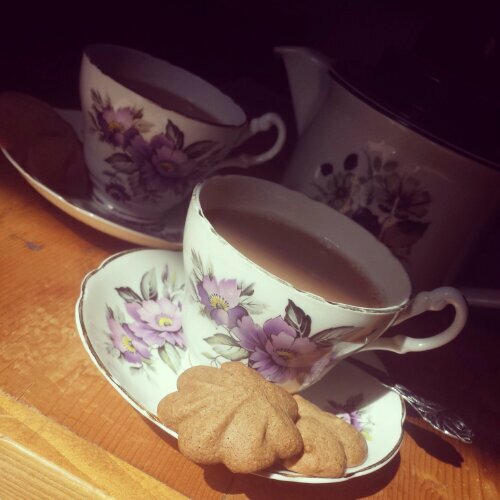 Who hasn’t tried Speculoos biscuits?? Anyone?? 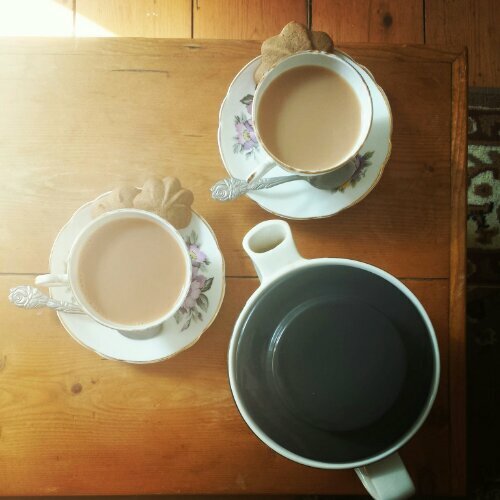 These little beauties are often found sitting on the edge of your saucer in coffee shops and are a Dutch favourite. They’re crisp, carmelly, sweet and spicy. Perfect for festive celebrations. 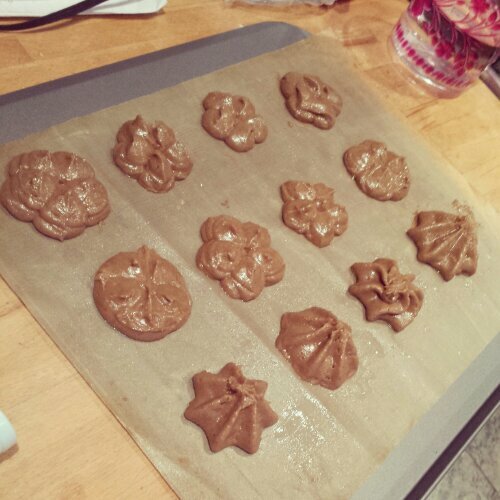 I’ve looked high and lo for the perfect Speculoos recipe and then decided to create my own. It’s very quick to make too! Beat everything together – very spicy! 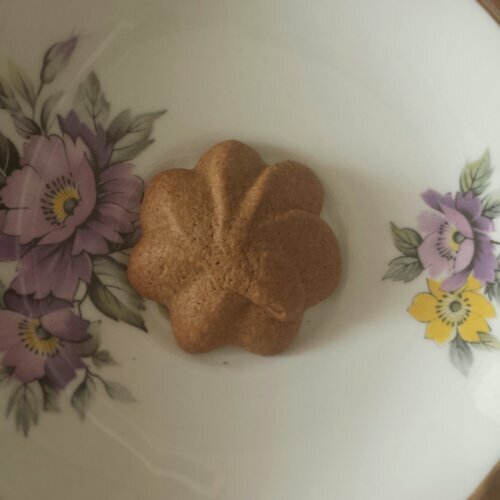 Traditional Dutch Speculoos are usually rolled out and imprinted with pretty patterns and designs. I don’t own anything pretty to imprint them with so I finally got to try out my biscuit gun! 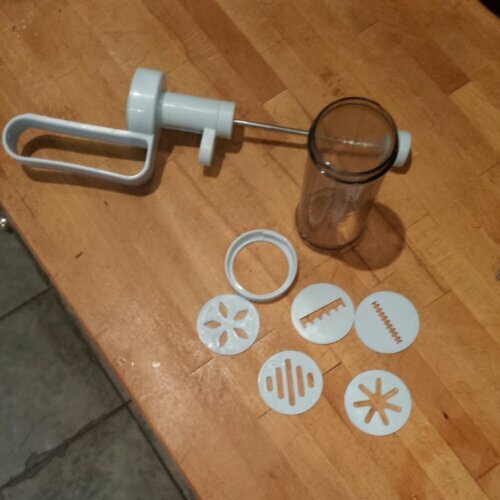 Which promises over 100 different designs… considering I bought it for £2 I was’t convinced it was going to work. Oh ye of little faith. 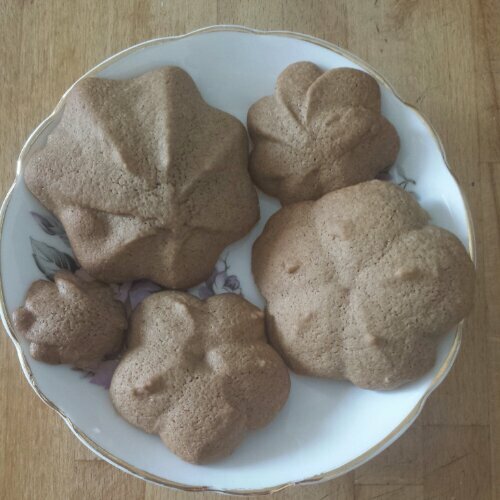 I knew that the traditional Speculoos recipe wouldn’t be suitable for use with a biscuit gun as the dough would be to thick to pipe through the patterned nozzles. I did what I always do and modified my recipe to my heart’s content. Adding treacle until I got the shiny, thick, gloopy texture I was hoping for. The tricky bit is working out how to force the dough/batter into the biscuit gun. I squashed it in with a spoon and had to refill regularly as there isn’t much space in the barrel, but this gave me the opportunity to try out a few different nozzles. I quite liked the star and flowers shapes. Once the dough is in the barrel you just press down on the level and force the dough out the end onto a greased and lined baking sheet. 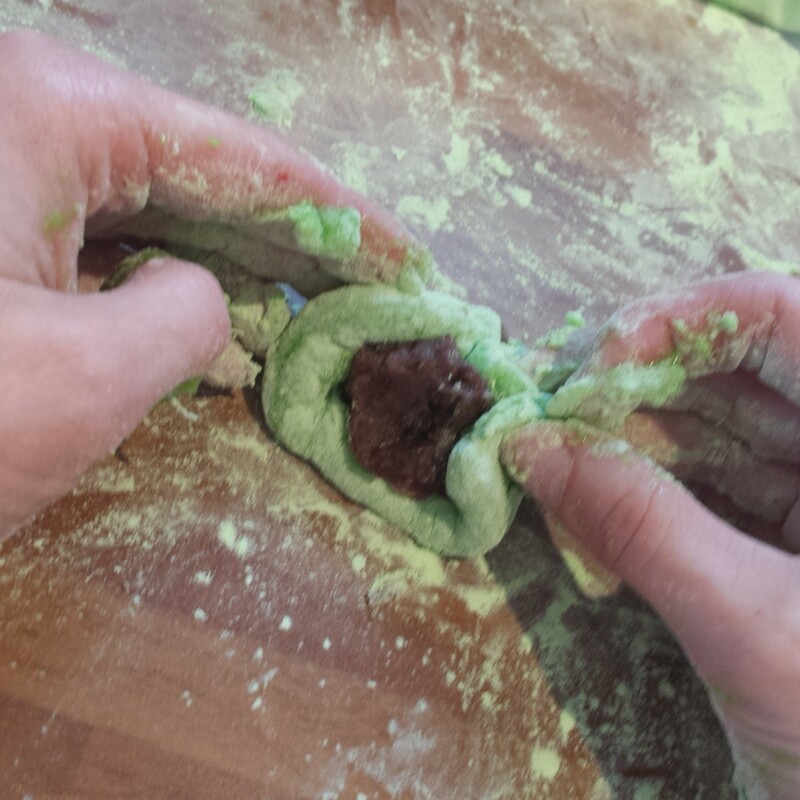 As the dough is a bit sticky it can be a tad awkward to cut off the dough so you can pipe a new biscuit… hence some of the more ‘interesting’ shapes I produced. Occasionally I resorted to chopping the dough from the nozzle with a knife, pushing the gun into the dough and pulling it away again quickly or twisting the gun until the dough broke naturally. Once you’ve experimented with a variety of patterns and piped the entire contents of your dough onto baking sheets, pop them in the fridge to harden for about 15 minutes. This means that the biscuits will hold their shape whilst baking, as the butter will be less likely to melt and spread. 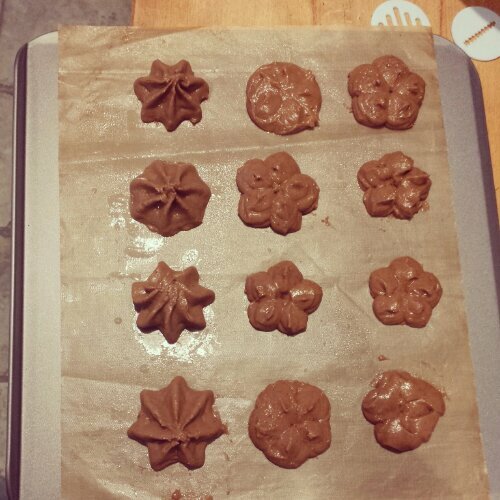 Don’t worry if you don’t have a biscuit gun, I also experimented with using a normal piping bag and star shaped nozzle which also worked rather well to make pretty swirls (even if I do say so myself). Or if you can’t be bothered with messing around making them look pretty and simply want to fill your mouth with speculoos goodness you could just use a spoon and whack a dollop of the mixture on the tray. Alternatively you could chill the dough/batter in the fridge so it’s much firmer (maybe overnight if needs be) and roll it out like you would normally with biscuits and cut them out with your favourite cutter. OR if that’s not enough options roll the chilled batter into a sausage, chill it in the fridge wrapped in cling film and then simply chop it into discs. Simple round biscuits with very little fuss or tidying up afterwards! I absolutely love these speculoos biscuits. The thicker the biscuit the more chewy they are. The blend of spices is full and comforting, which the added sweetness of the treacle makes it my perfect winter bake. 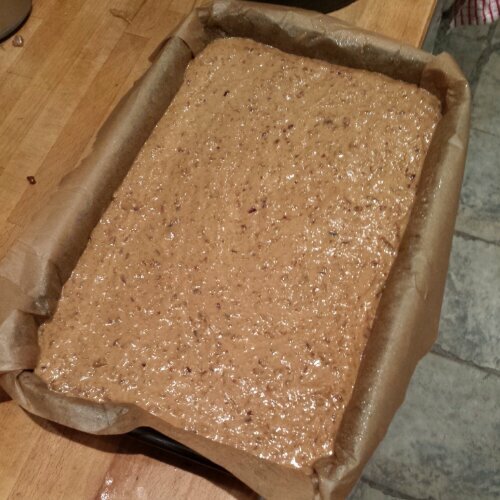 In my haste to create Speculoos, I seem to have almost stumbled onto my own lebkuchen hybrid. The biscuits have a crispy sugar coating (without the need for any icing) and a chewy rich centre. Even the mini speculoos have a great snap and chew to them. Speculoos biscuits freeze extremely well too so you can reveal wonderfully festive biscuits at any time of the day or night when friends or family call round. 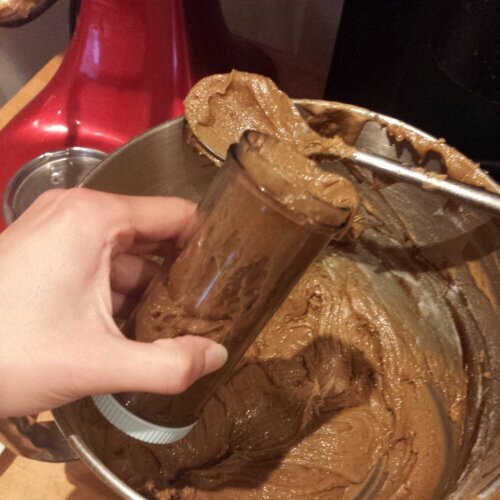 I plan on making my spectacular speculoos again very soon. Maybe for bonfire night and also when I perfect the recipe for rolling, I’m going to make speculoos baubles to adorn my Christmas tree with! Let them cool (if you can!) 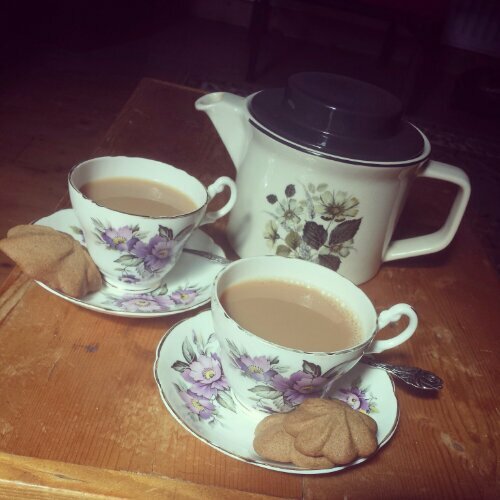 and eat with a proper cup of tea. Am I attempting to elongate my around the world in 80 bakes challenge somewhat or am I just easily distracted? 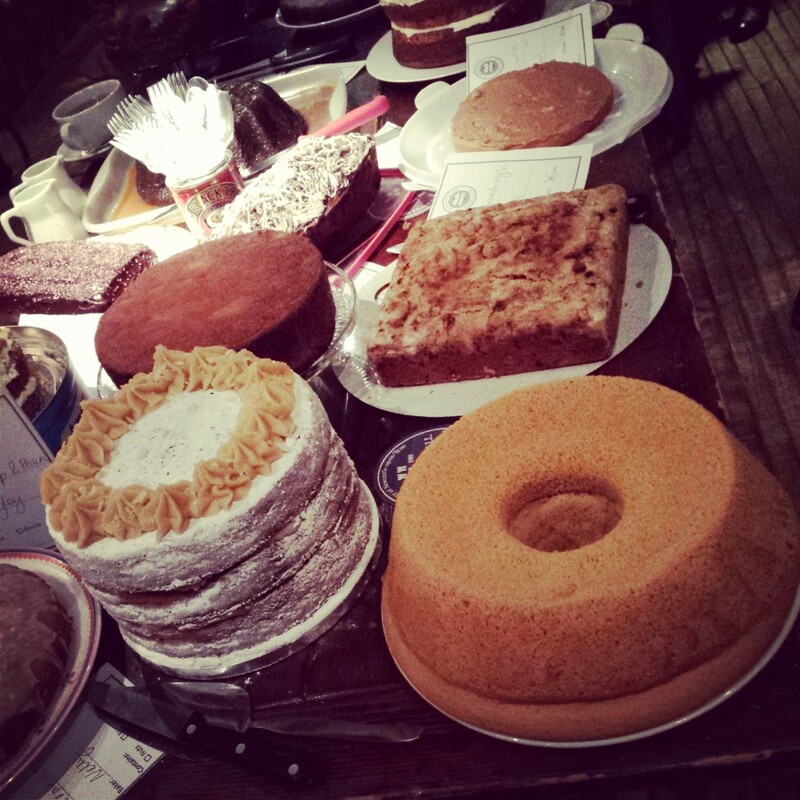 Perhaps I’ve exceeded my capacity for cake. Who knows. But it seems I’m having a dalliance with bread baking at the moment. 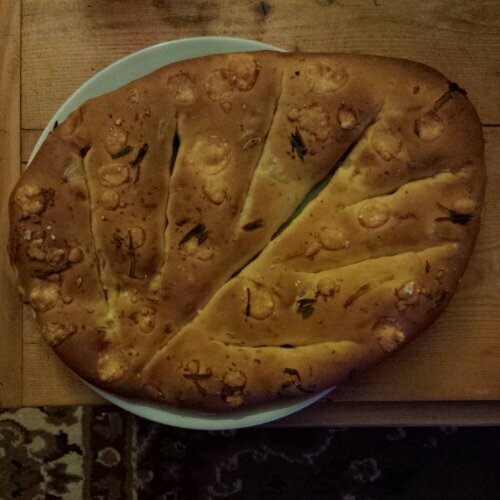 I couldn’t let Fougasse pass by undocumented, as something I’ve baked and forgotten about disappearing into the reams of photo I’ve #justbaked on instagram. I had to tell you about them. I realise I’ve baked rather a lot of French things thus far from Tarte au citron, to baguettes so I’m not counting Fougasse as one of my around the world in 80 bakes. BUT they are deliciously simple, despite their extremely complicated and masterful appearance. I gleefully clapped my hands together upon opening the oven door to reveal perfectly formed bread fronds. 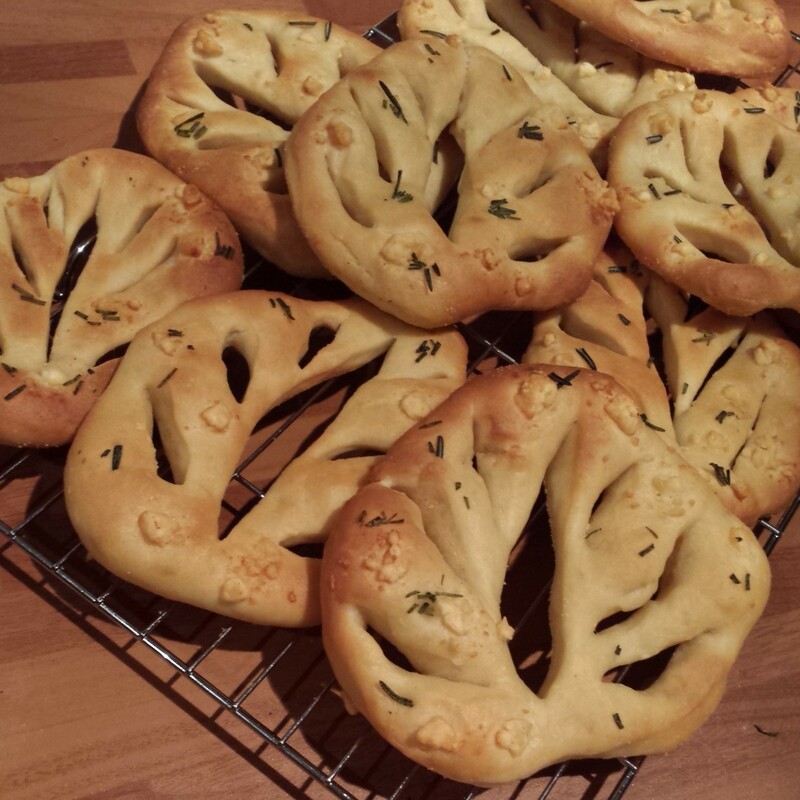 You can flavour Fougasse with any herb that you like.I foraged some rosemary from a sandwich buffet that was only used for decoration for an hour and was binward bound. I couldn’t face such waste so pocketed it for baking, to put it to good use alongside rock salt, shallots and pebbles of pecorino cheese. Future Fougasse that I have planned in my head include, roast pepper and garlic; mint and feta; basil and chilli; chia and sesame seed. 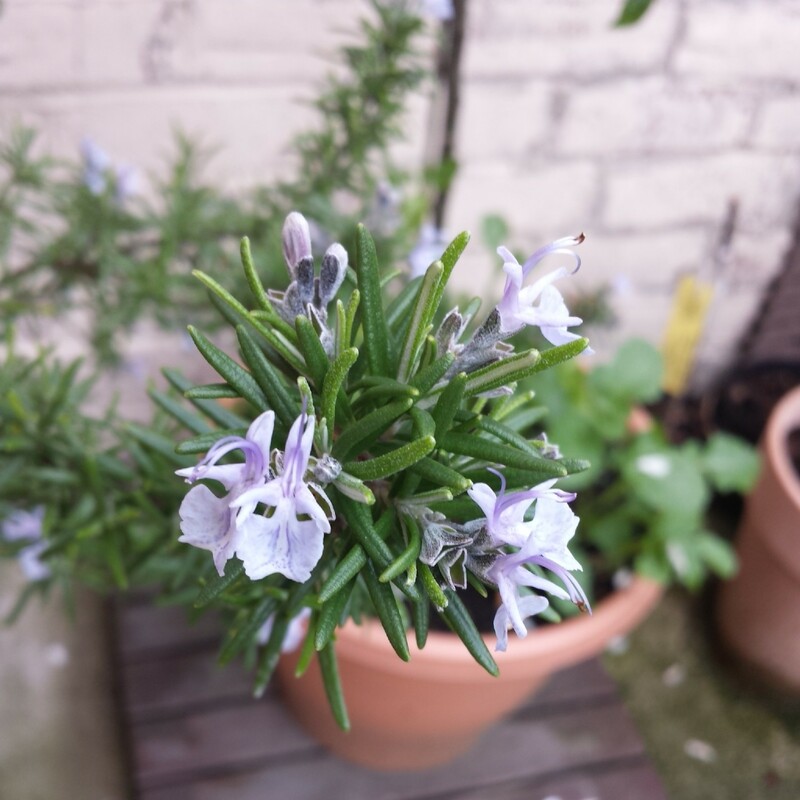 I’m also taking advantage of the Rosemary bush we’ve inherited in our new home. I can’t stress enough how simple a dough it is. It’s a basic white dough that can be adapted to make 2 large fougasse or as I’ve made since, many small palm sized fougasse. An impressive side dish to whip out when friends come for tea which can be frozen and defrosted as required. 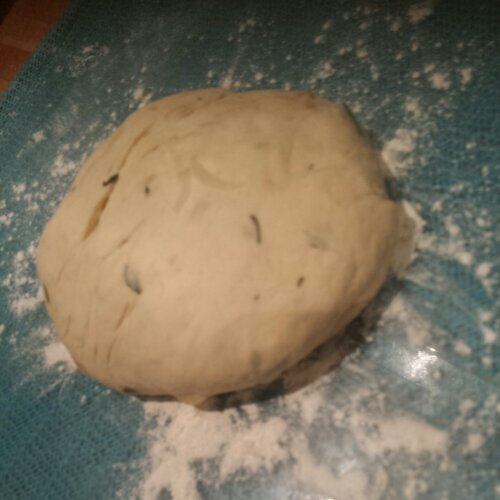 As with most doughs mix the ingredients together to form a sticky dough. Knead for about 10 minutes until smooth. Place in a large bowl, cover with greased cling film and leave to prove for 1 hour until doubled in size. Once proven, knock the dough back and knead in your chosen flavours. 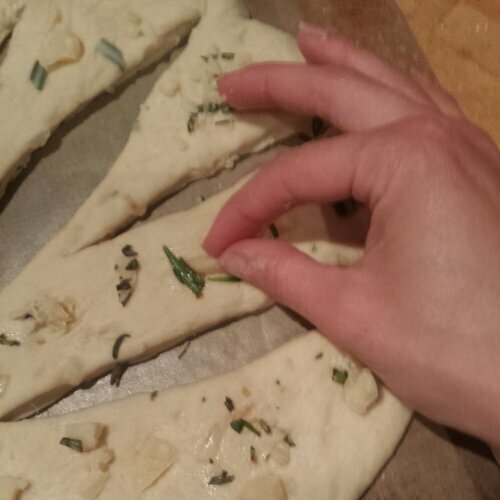 If using rosemary and onions chop them finely first and sautee the onions in a little oil Then divide your dough into 2 equal amounts (if making large fougasse) or 12 pieces (if making mini fougasse). Roll it out on a lightly floured bench to a thin rectangle about 5mm in depth and about 20cm x 25 cm. The onions will make the dough a little sticky and can be a little more tricky to slice through later on. Then comes the fun bit. Pop your flat dough onto a lined and semolina sprinkled baking sheet. I like using a pizza cutter for my long slashes in the dough. 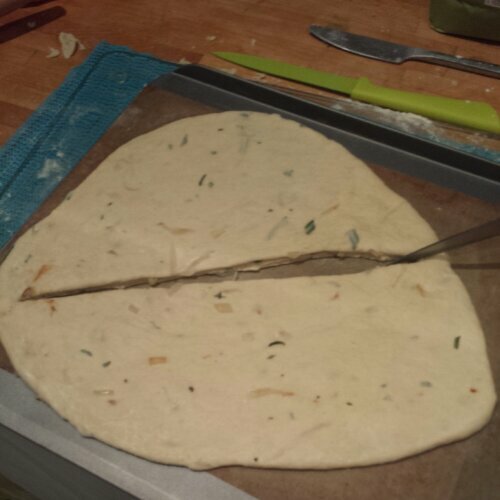 You have to split the dough up the middle, cutting all the way through and gently encourage the dough to separate, so there’s a space (you can see the baking sheet underneath). 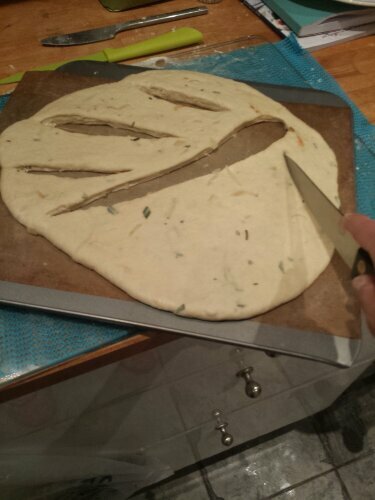 Make one diagonal cut (1cm in from the edge so there is still some dough attached to hold your fougasse together) from one end of the dough to the other, leaving 1cm at the opposite end untouched. 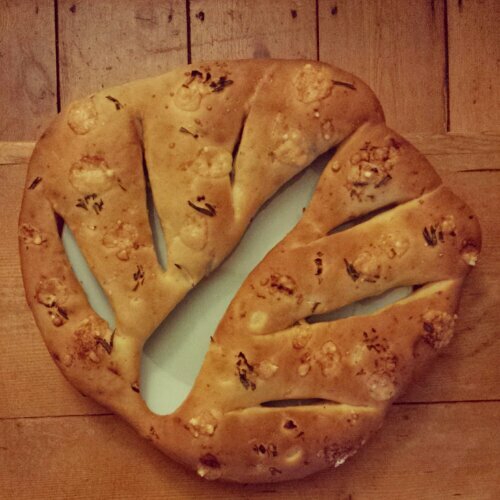 Stud your fougasse with chunks of parmesan and any extra rosemary that you’ve saved for extra flavour. 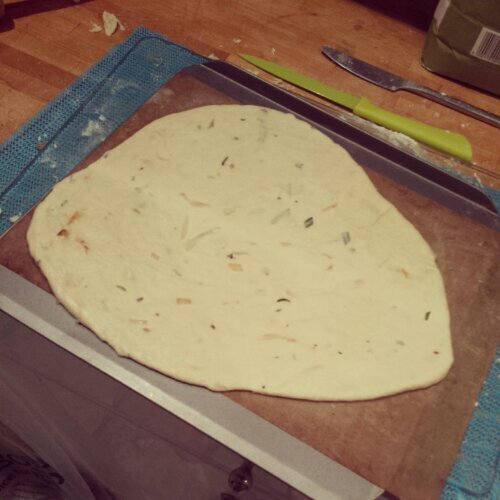 If making mini fougasse, repeat this until you’ve shaped all of your dough. Cover it with greased cling film and leave to prove for 20 minutes until puffed up. Bake your Fougasse in a pre heated oven at 220 degrees c for 13 – 15 minutes until golden brown. These are delicious served warm, with a rich tomatoey or pestoey pasta dish, but equally tasty served cool and enjoyed independently as a feast in the palm of your hand. They also freeze very well so you can save some for later, or bake it in advance. 1. Knead dough together for 10 minutes. Cover and prove for 1 hour. 6. Place on semolina sprinkled baking sheet and cut into the dough as described above. Studding with parmesan. 8. Bake at 220 degrees C for 13 -15 minutes until golden brown and the parmesan cheese crisps up slightly.